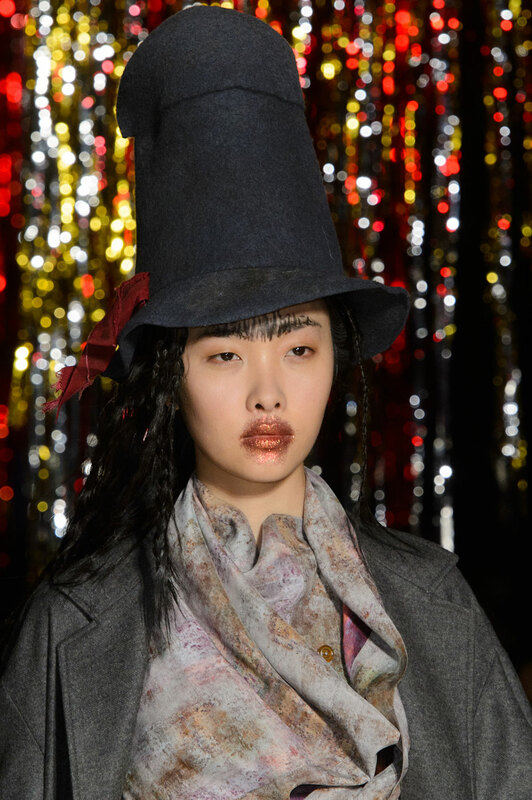 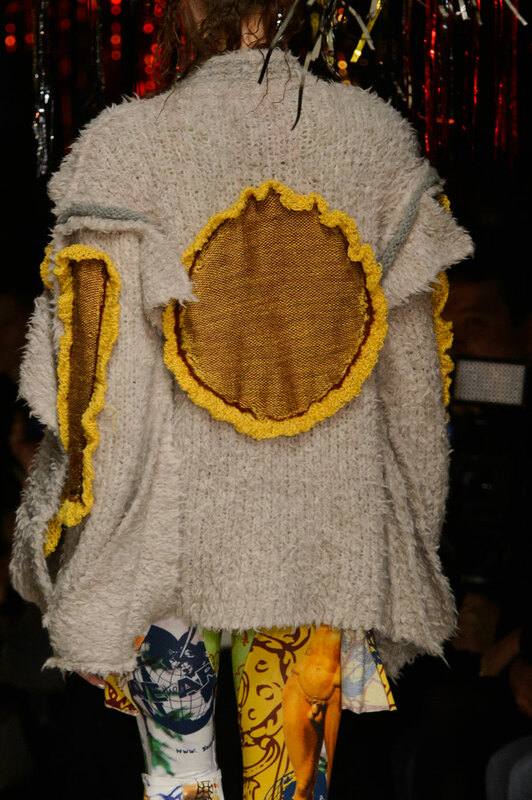 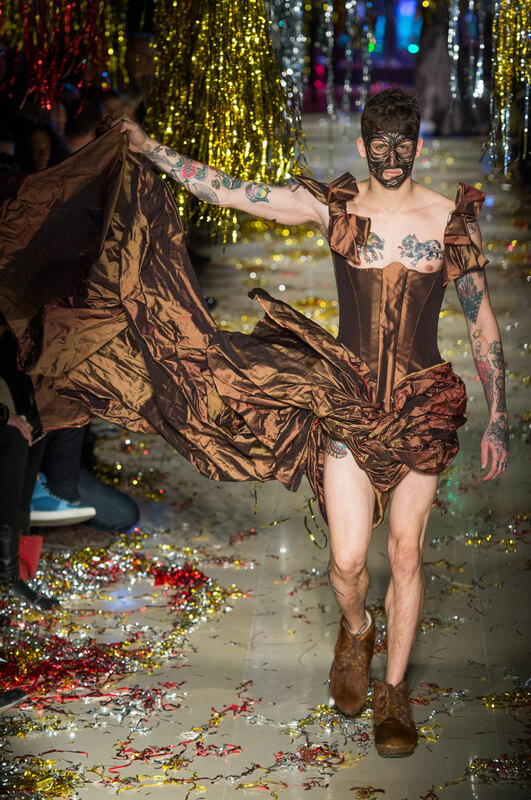 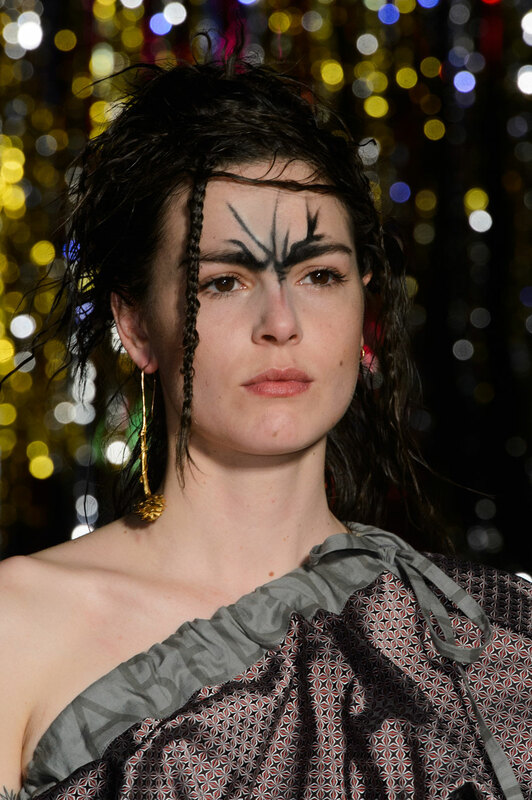 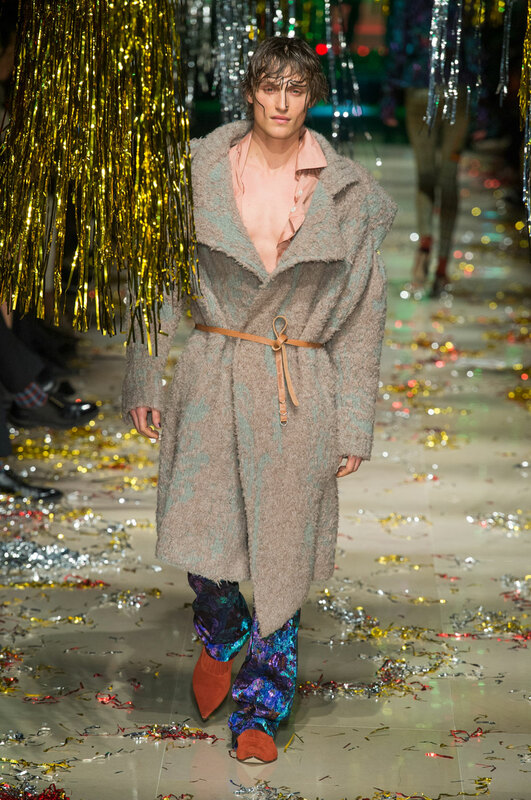 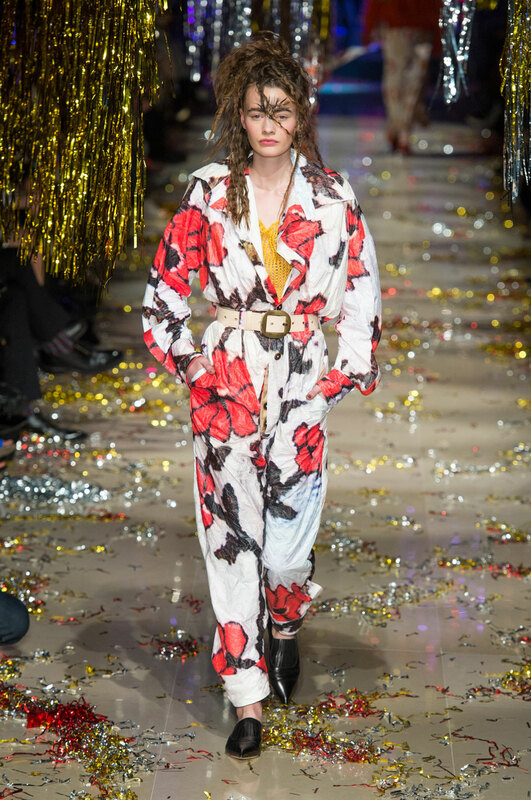 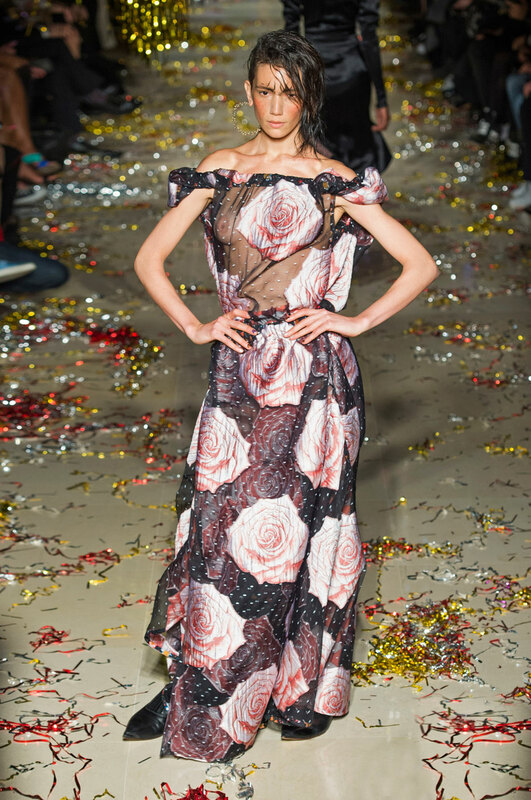 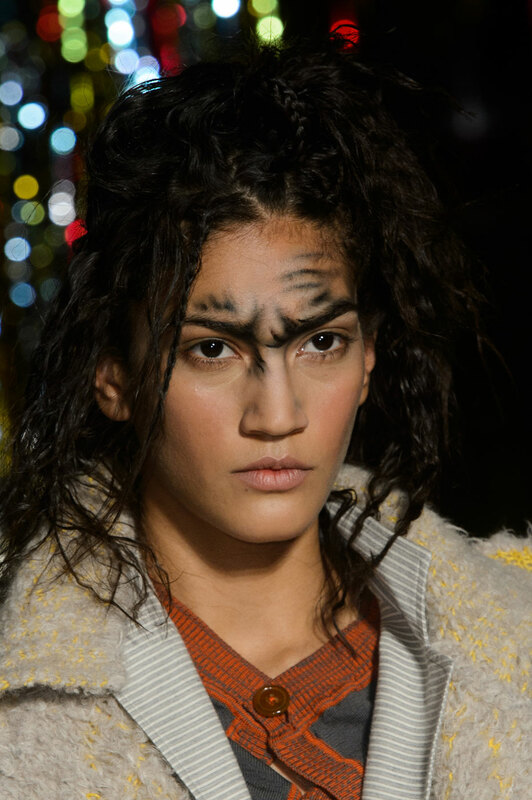 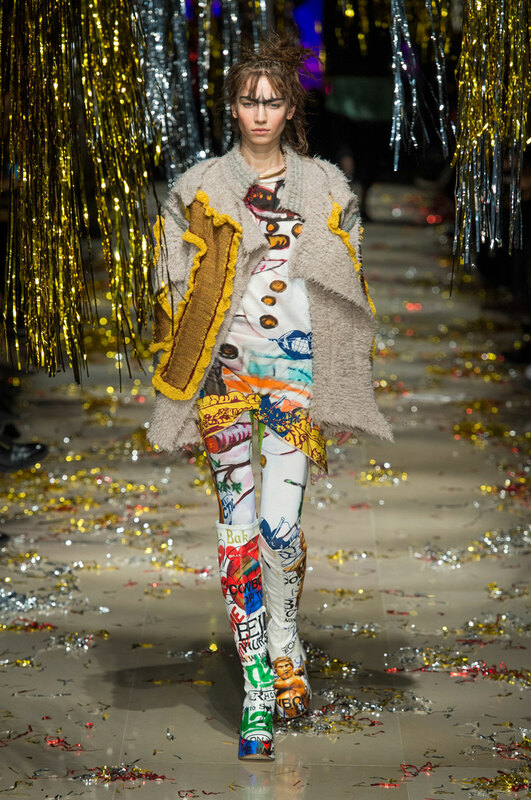 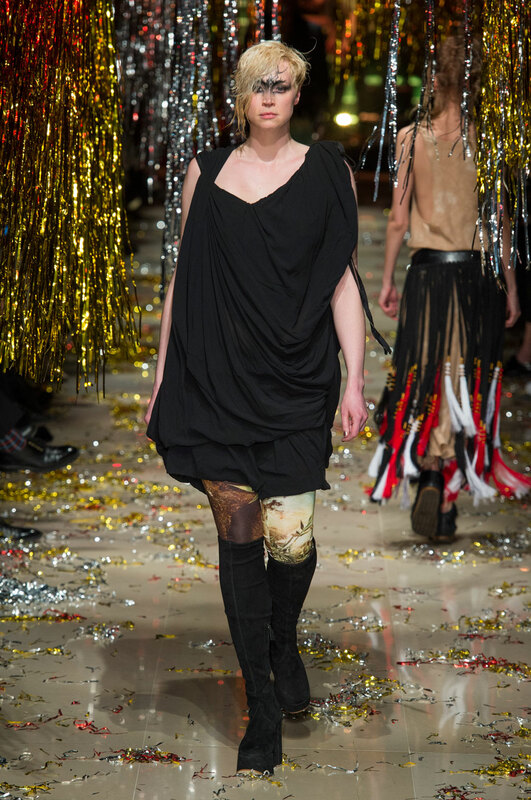 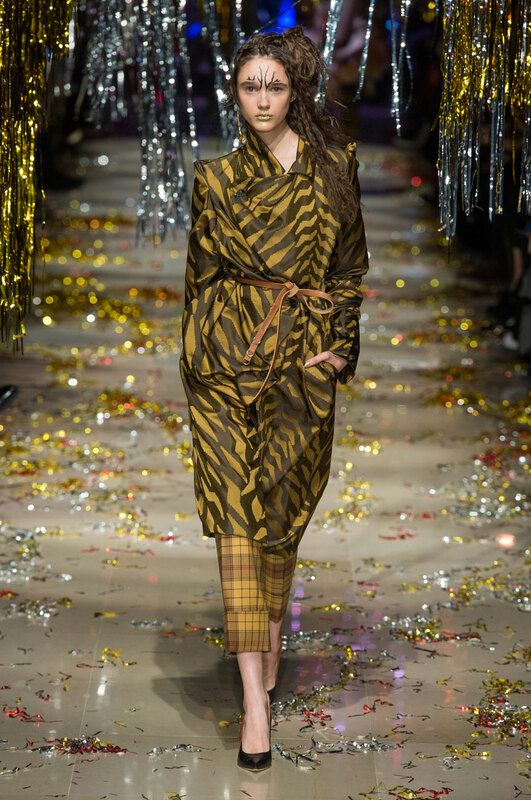 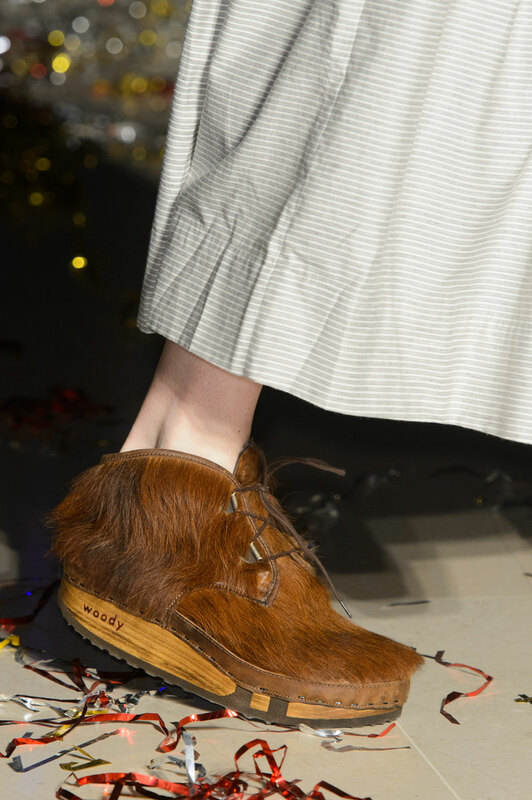 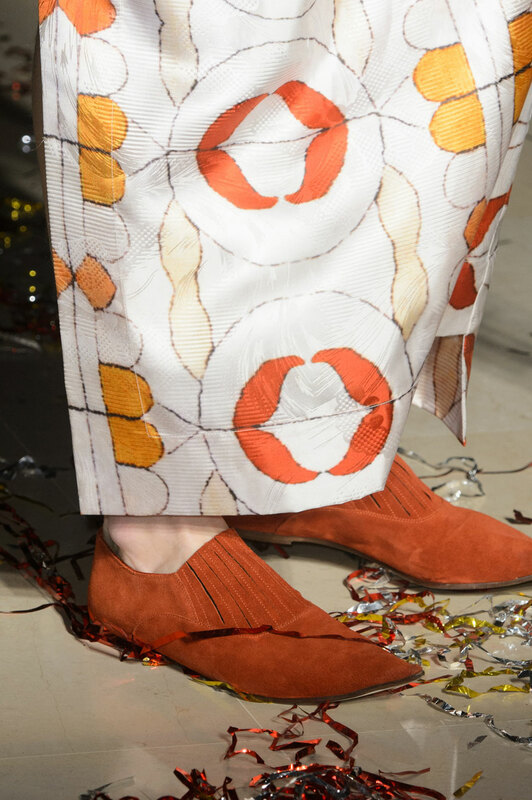 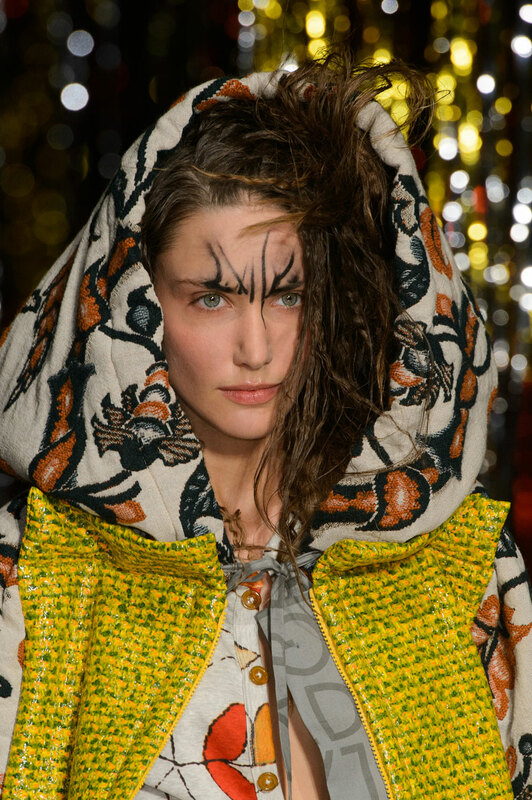 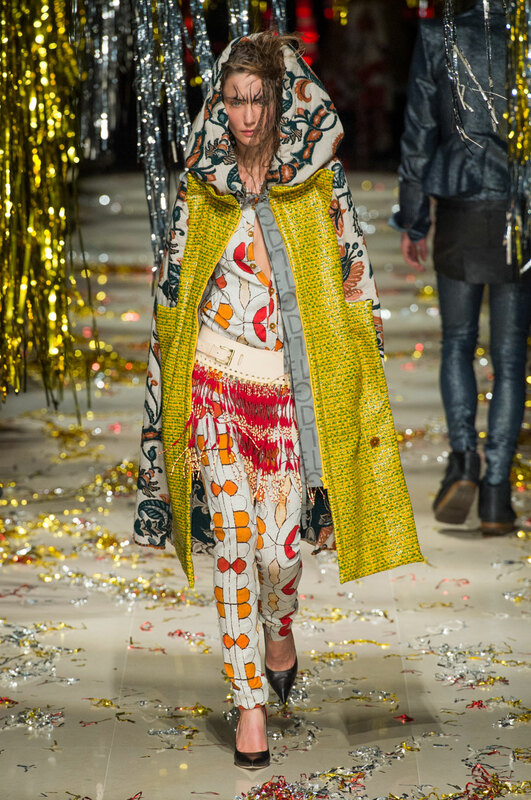 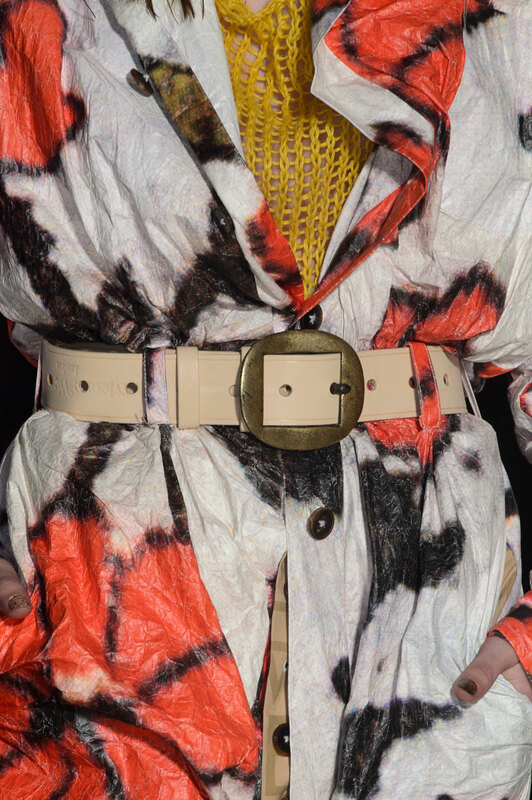 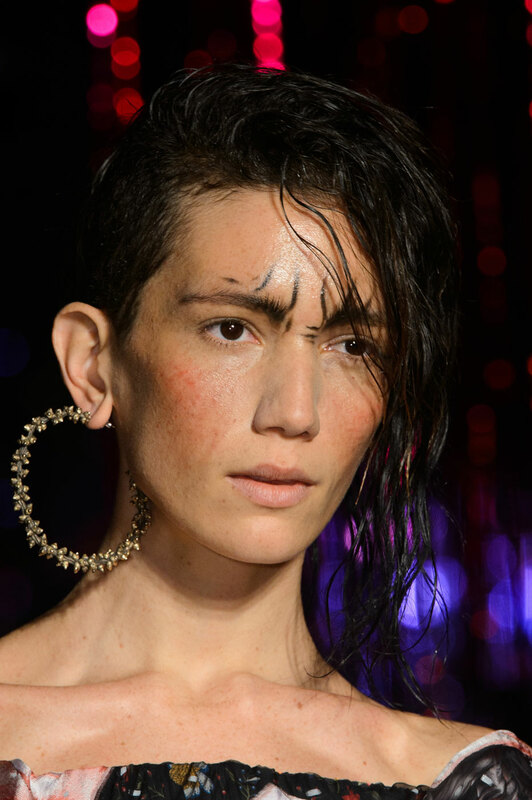 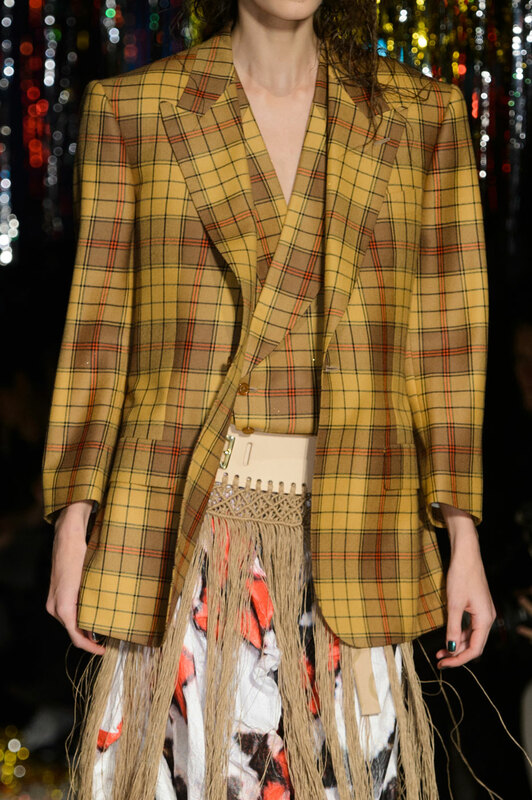 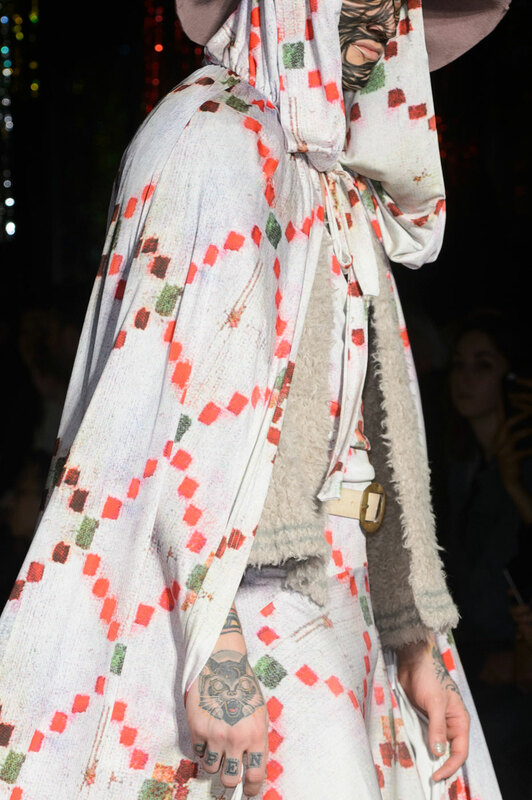 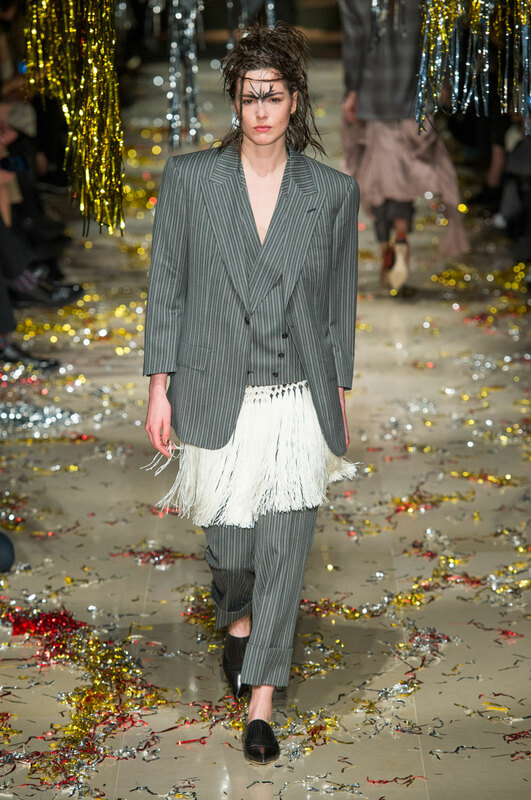 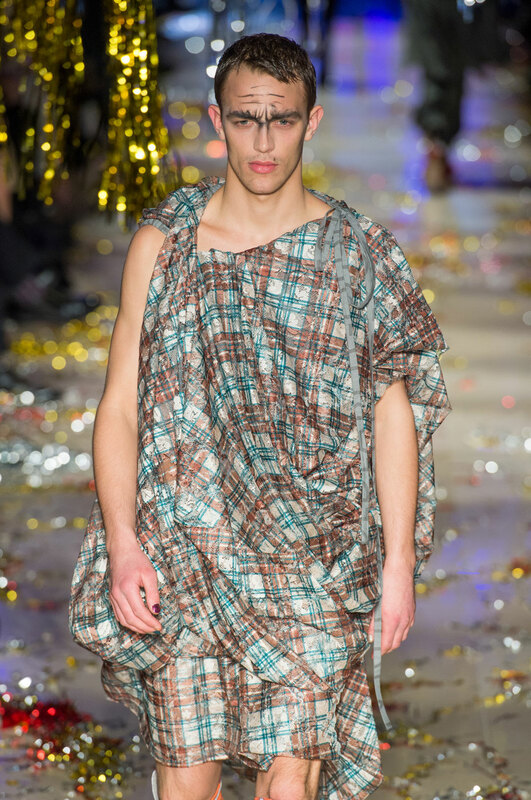 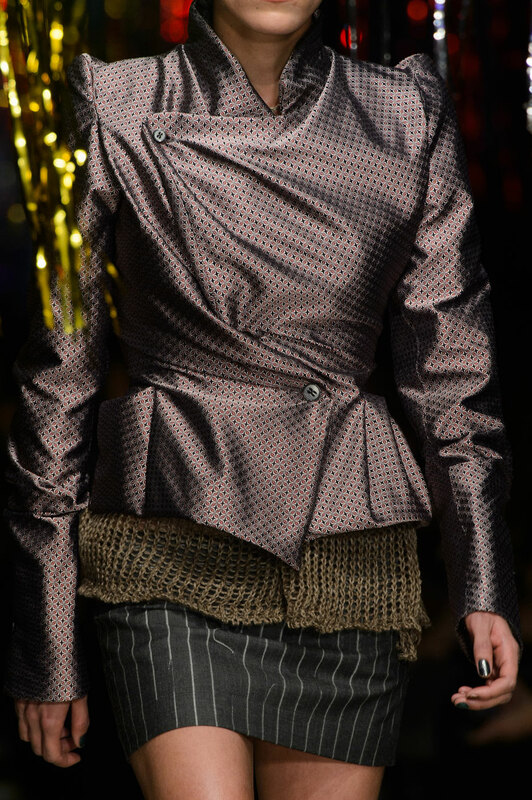 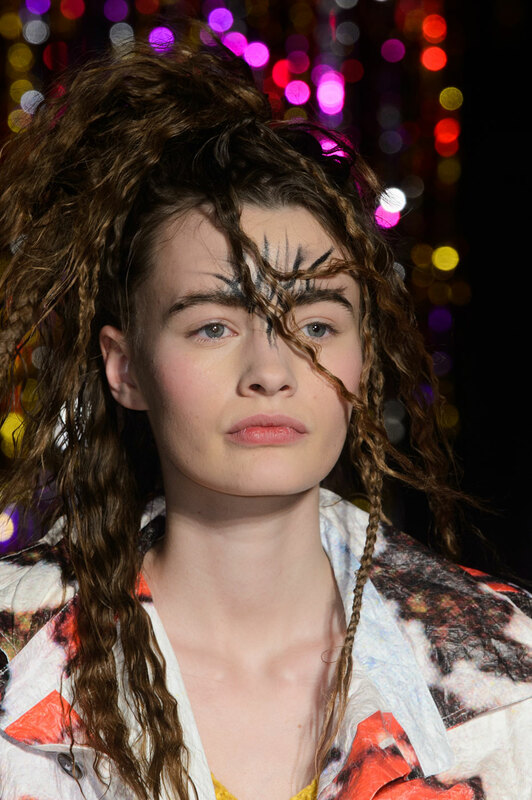 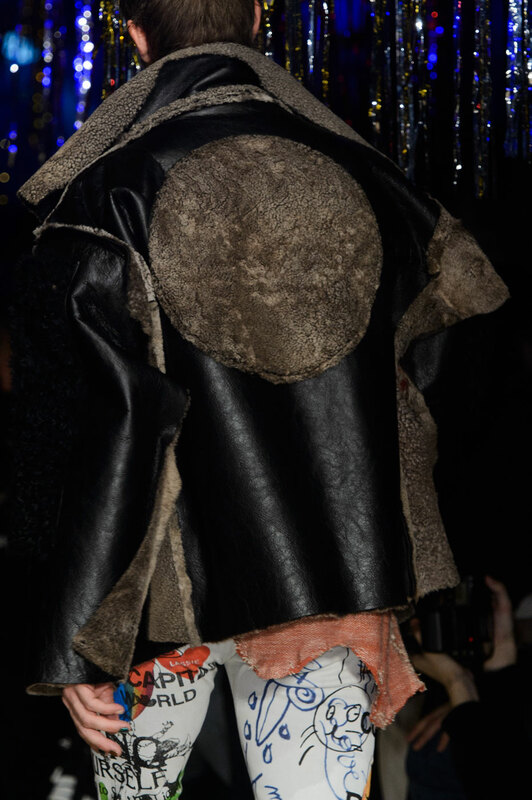 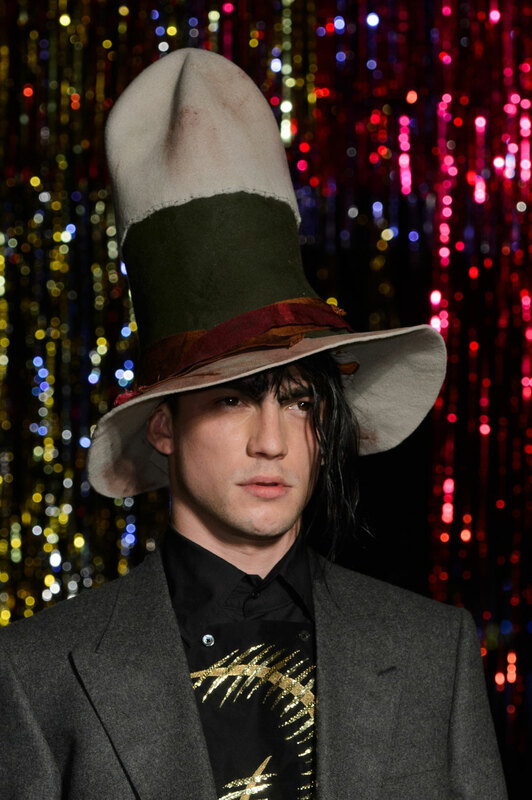 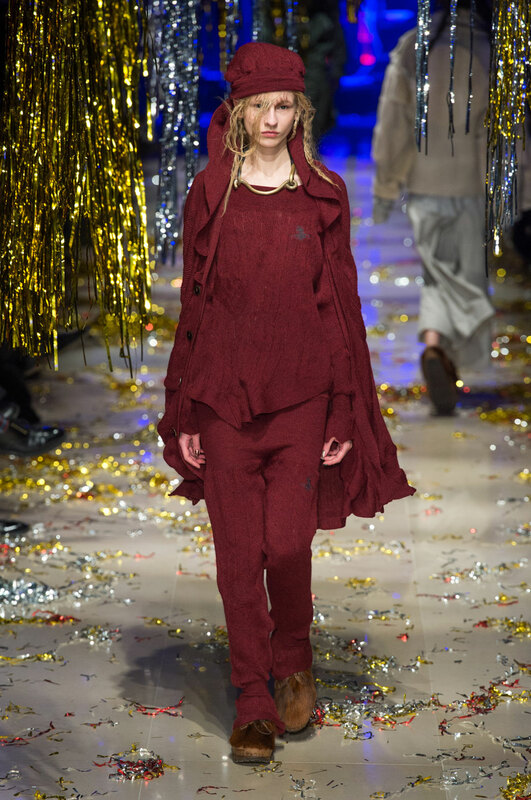 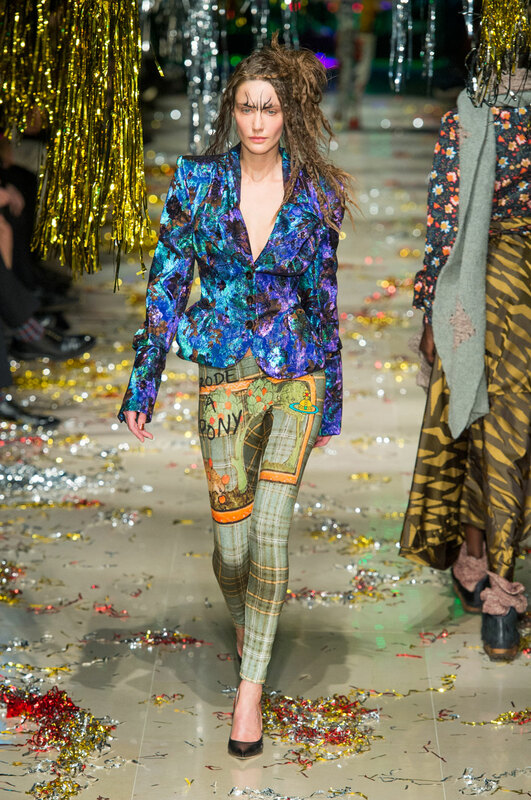 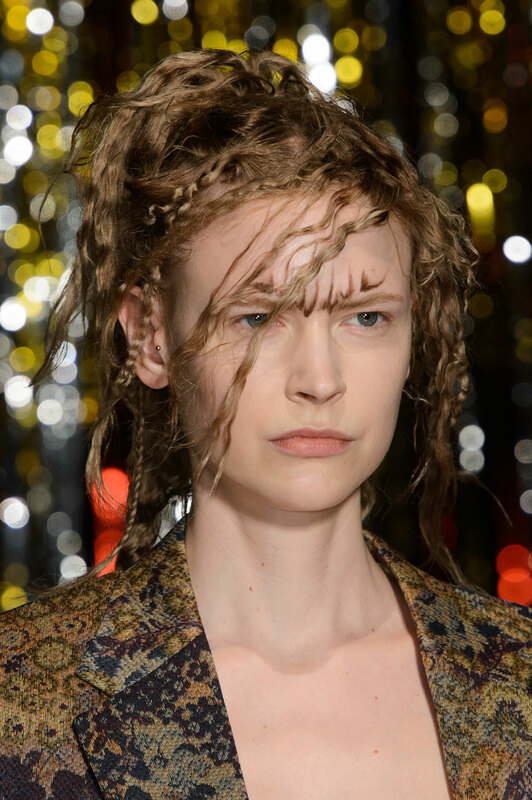 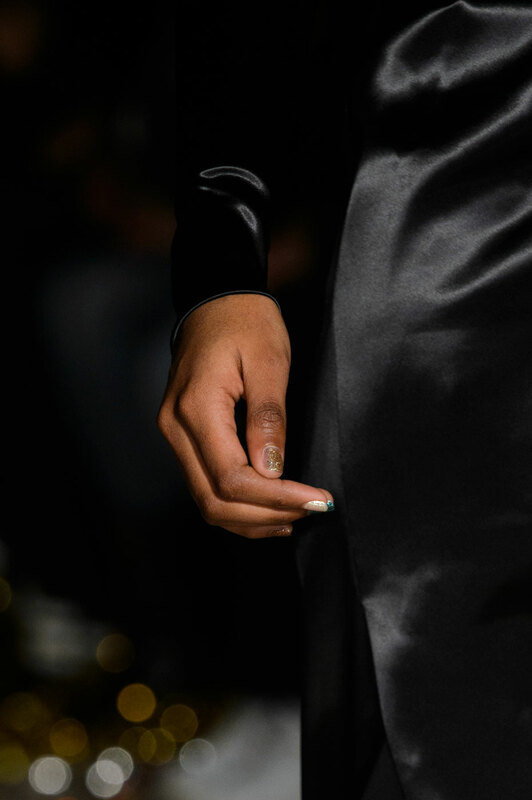 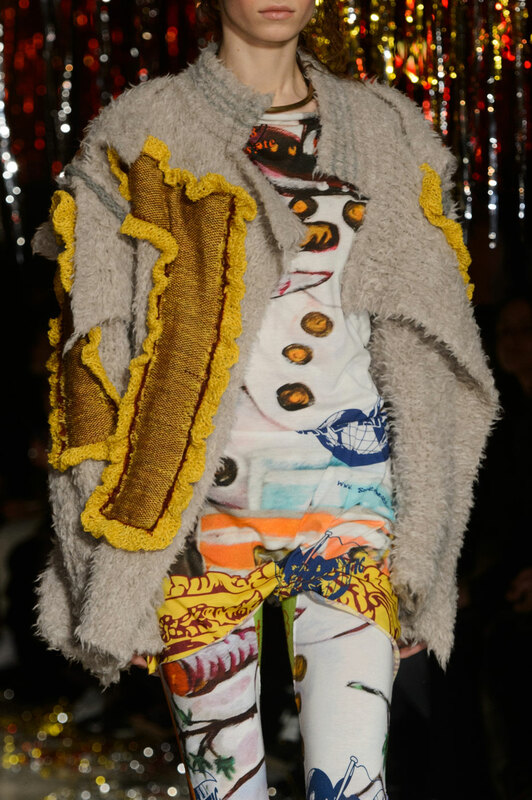 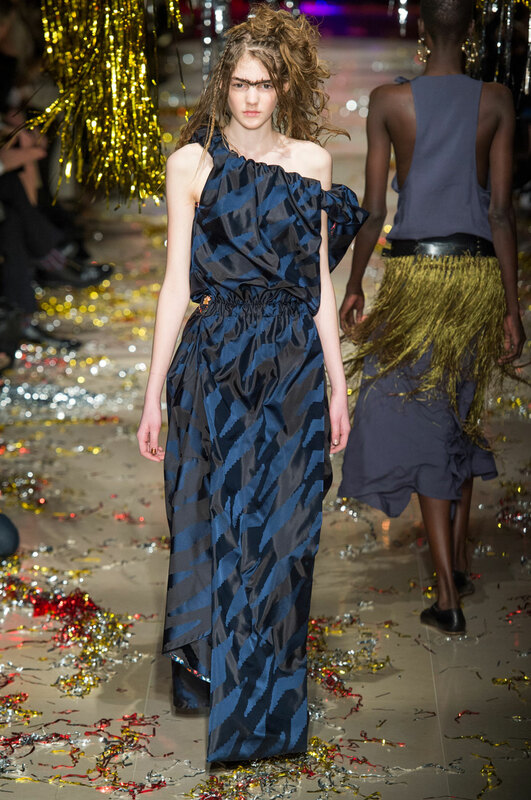 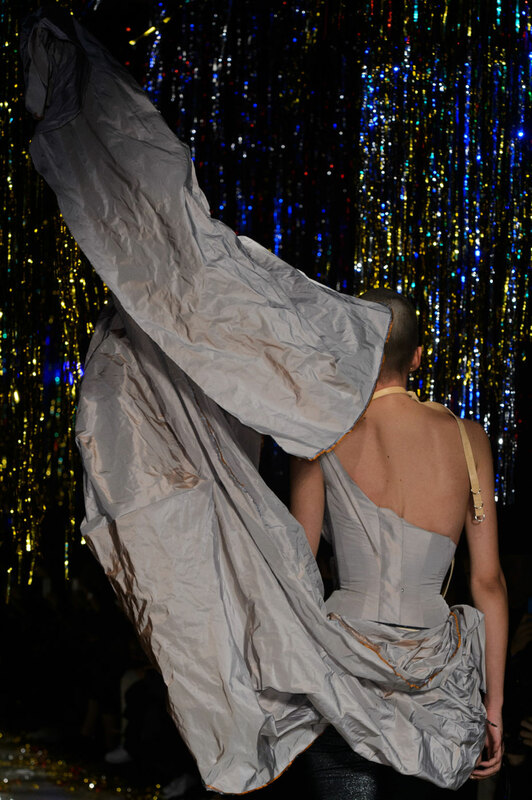 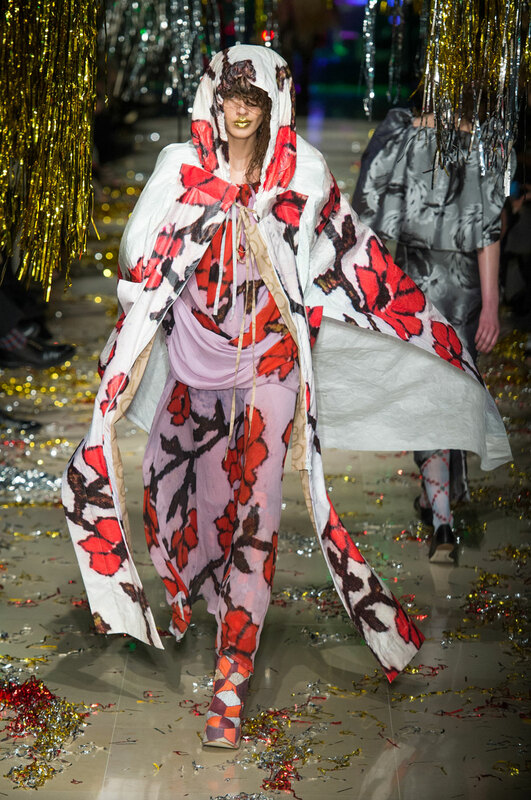 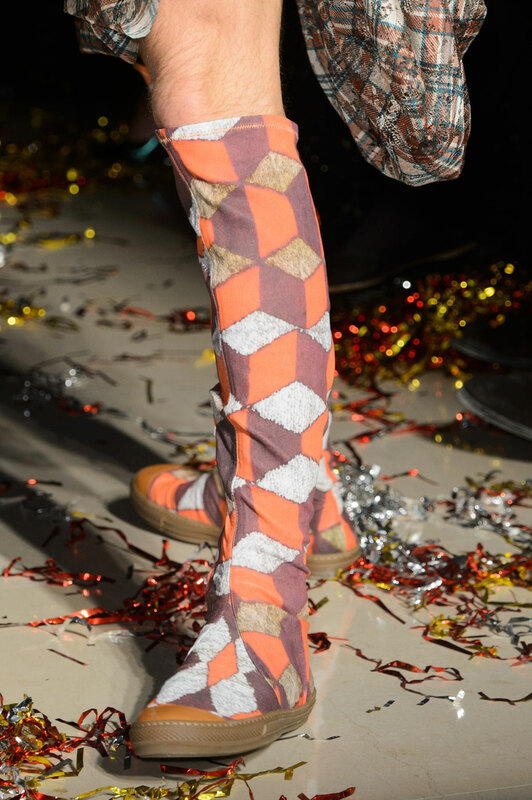 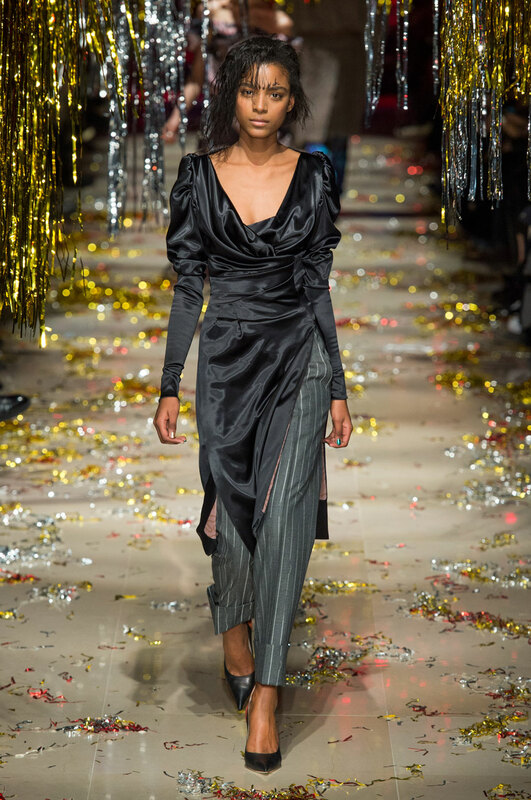 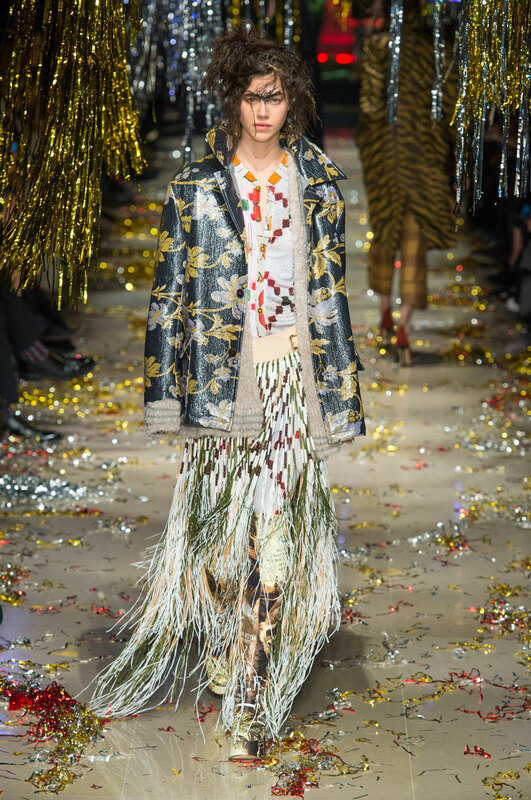 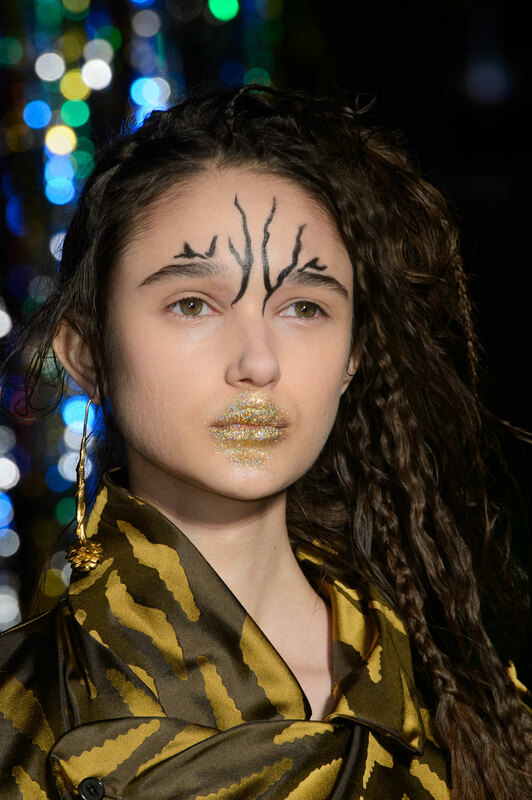 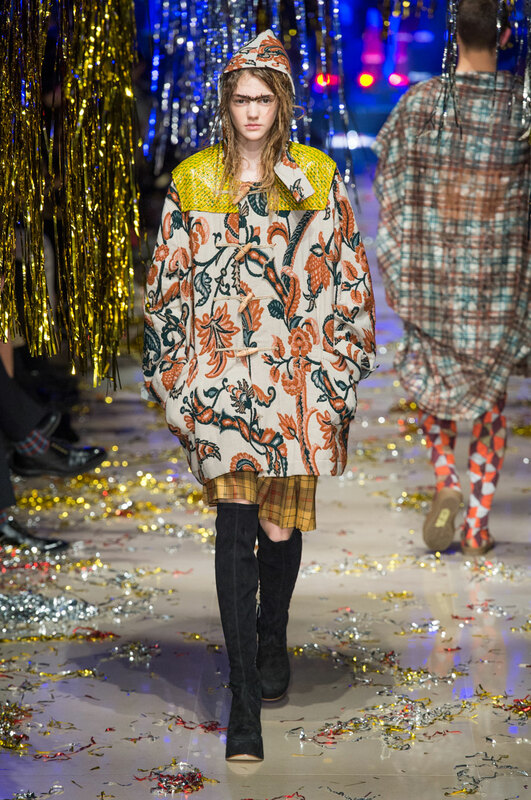 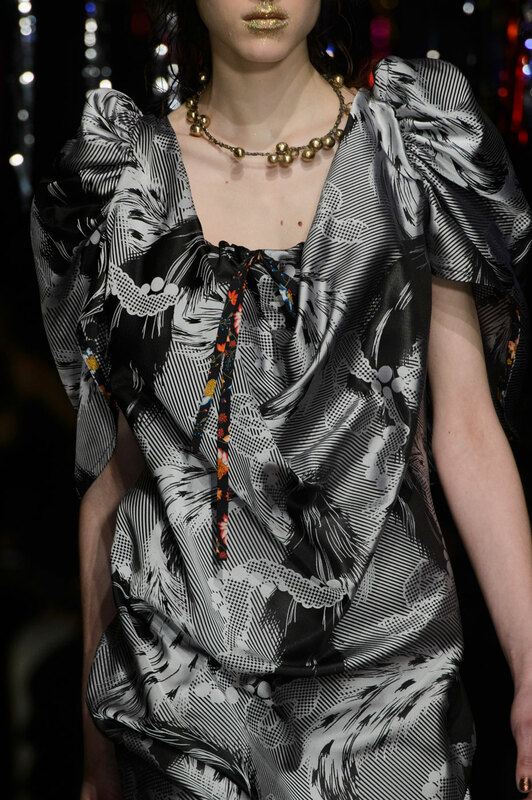 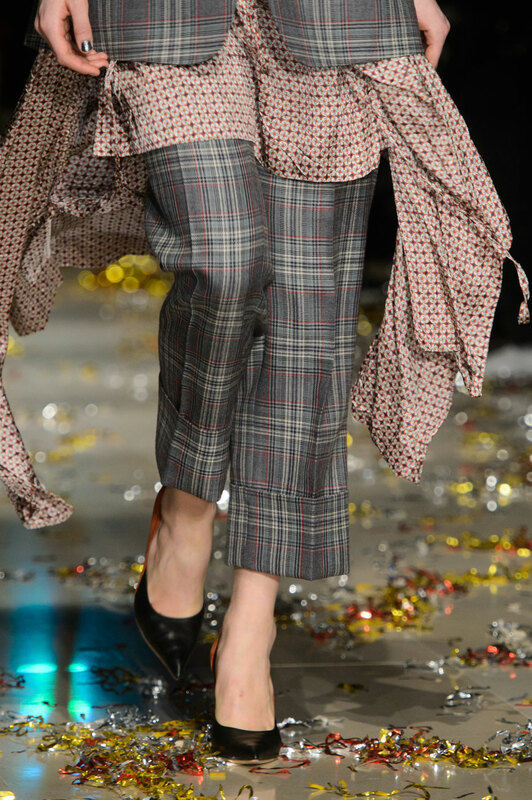 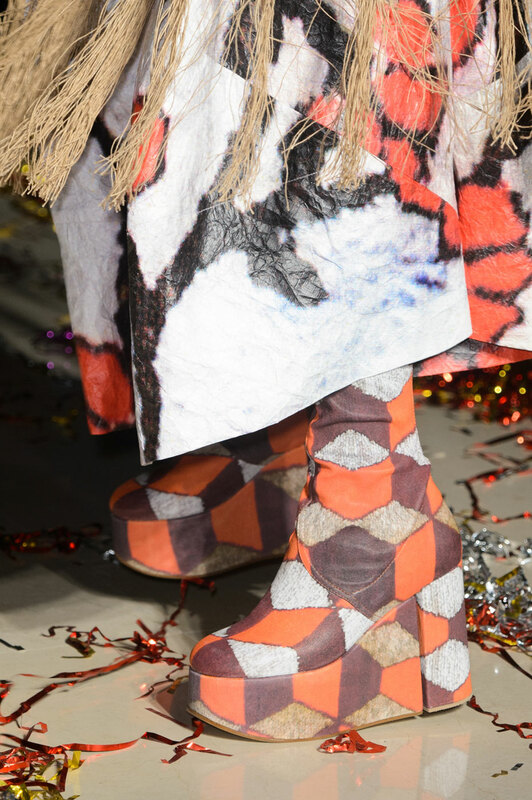 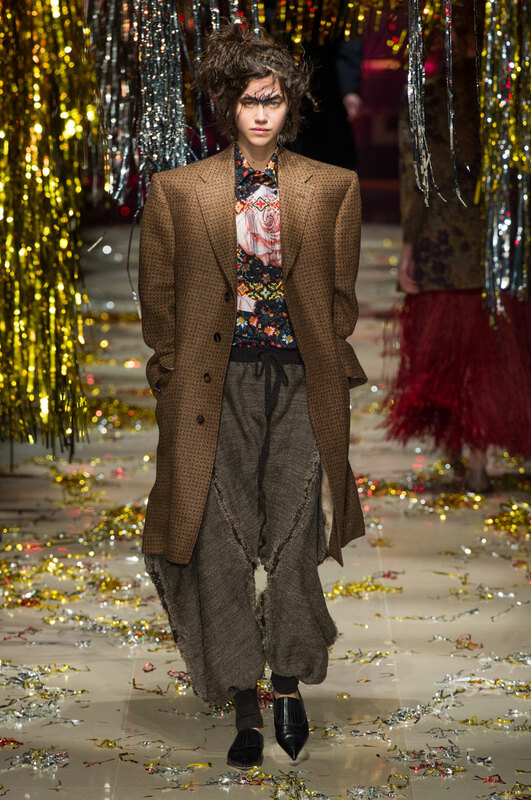 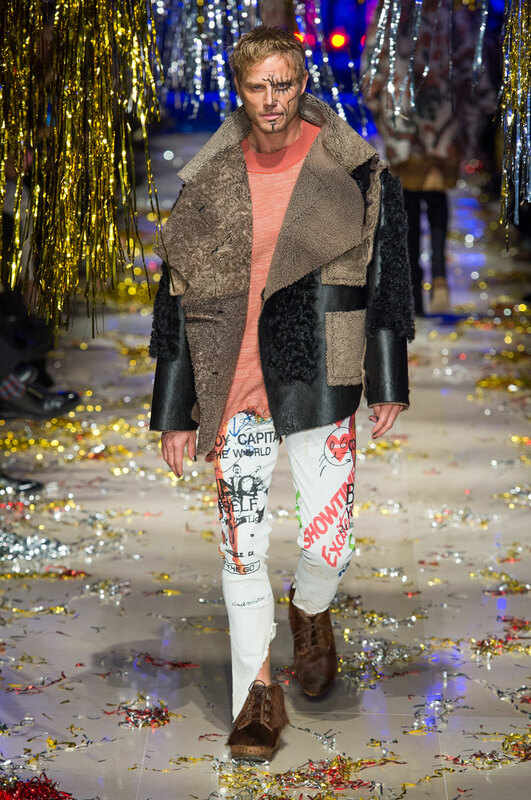 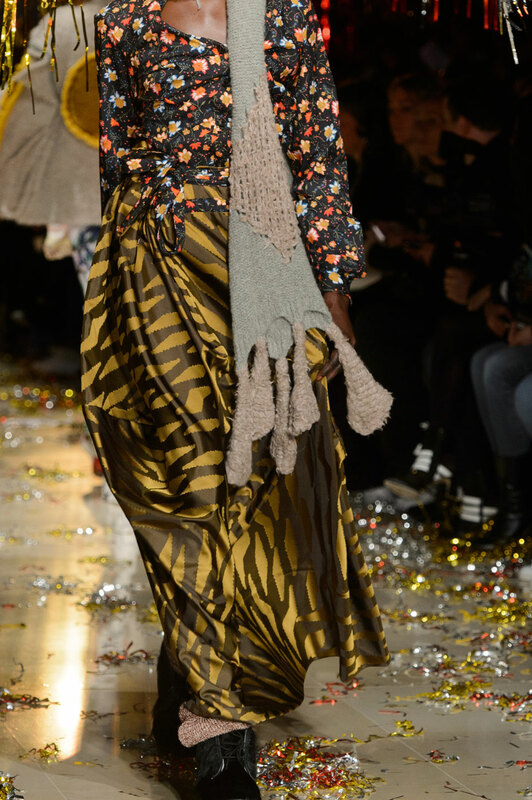 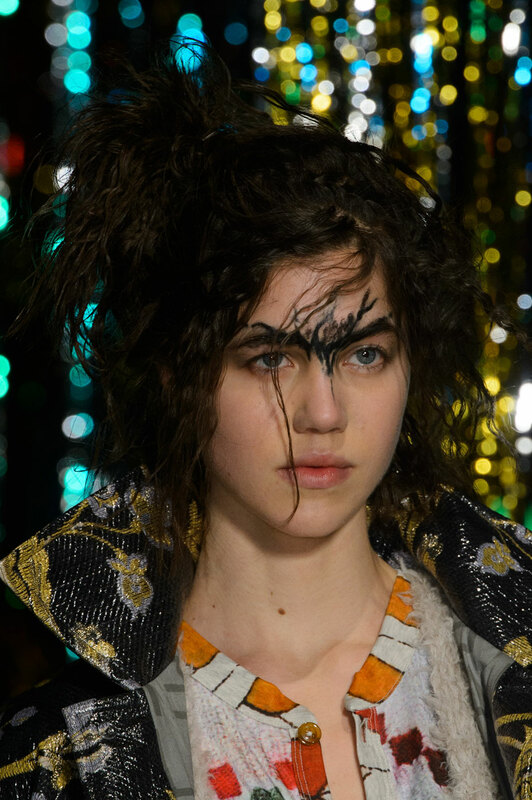 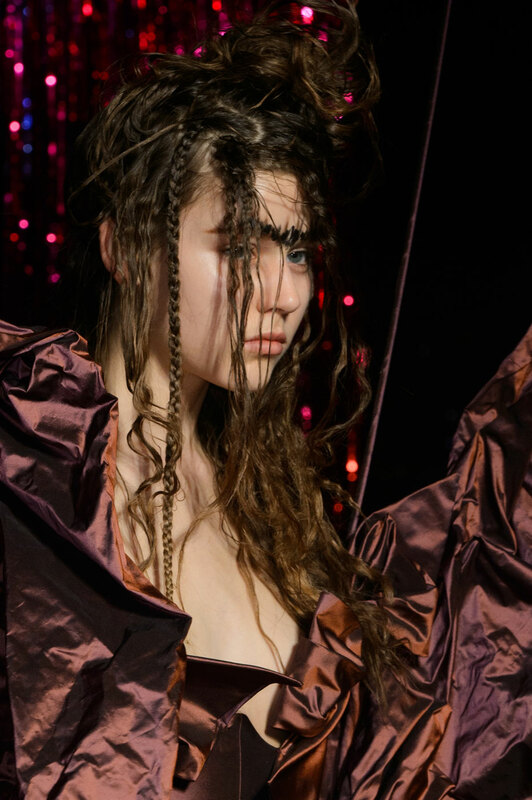 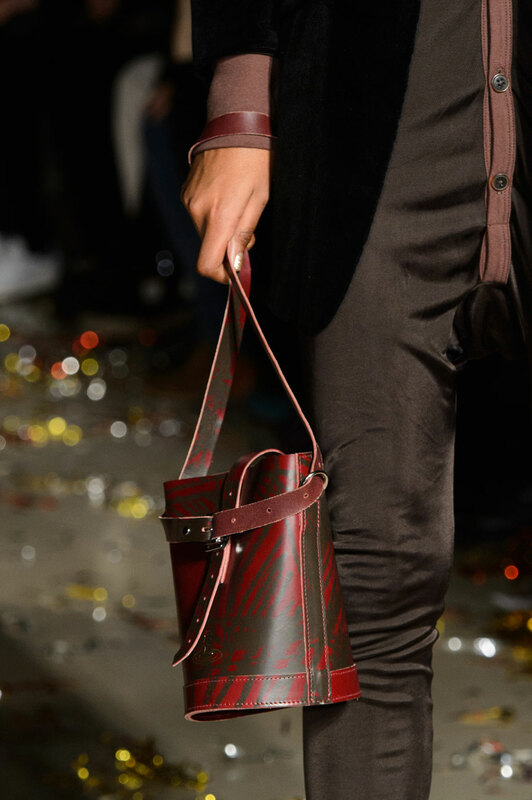 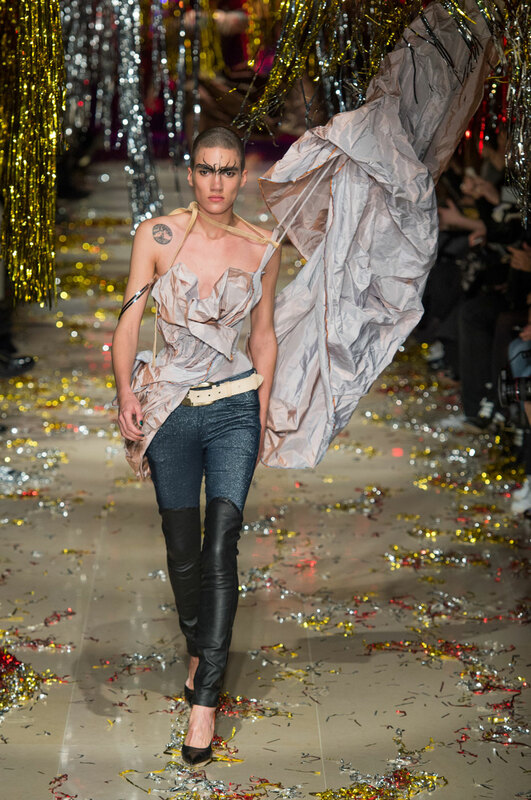 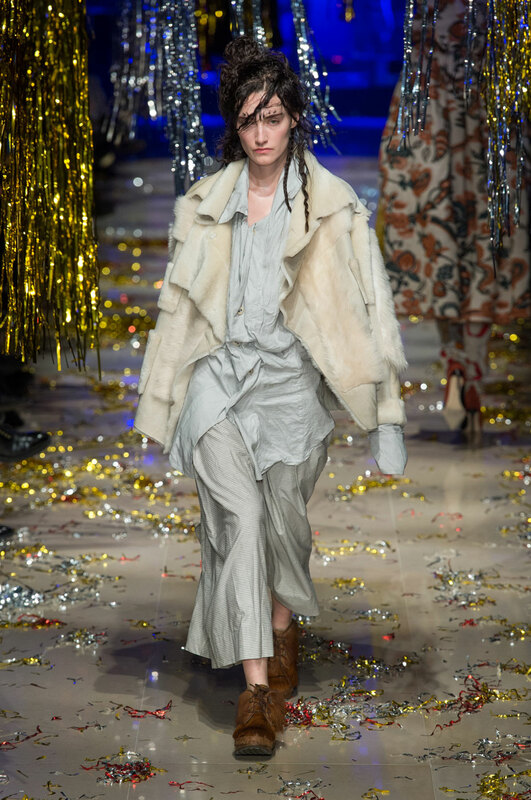 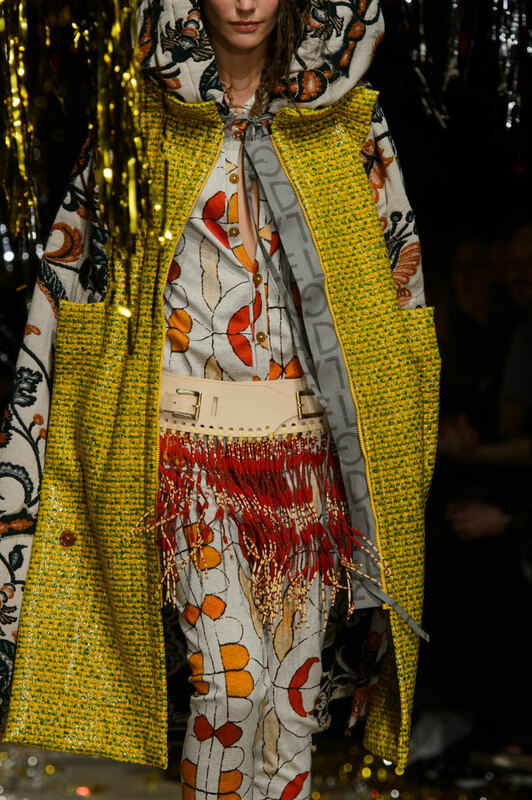 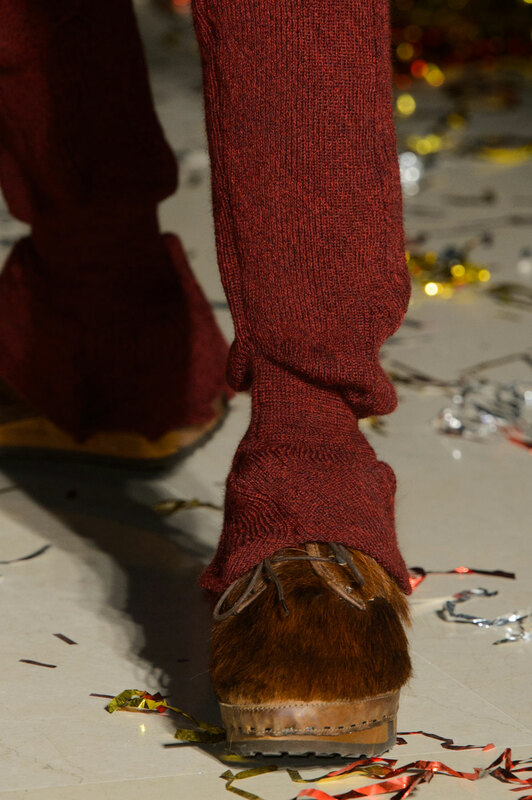 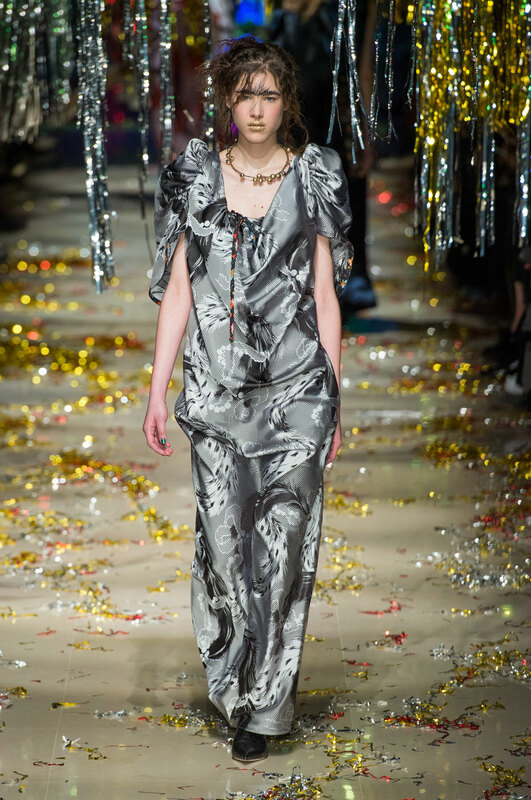 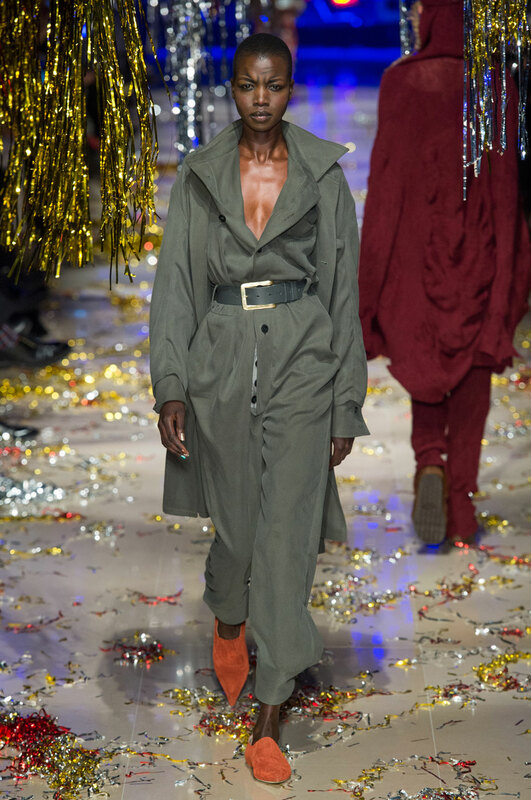 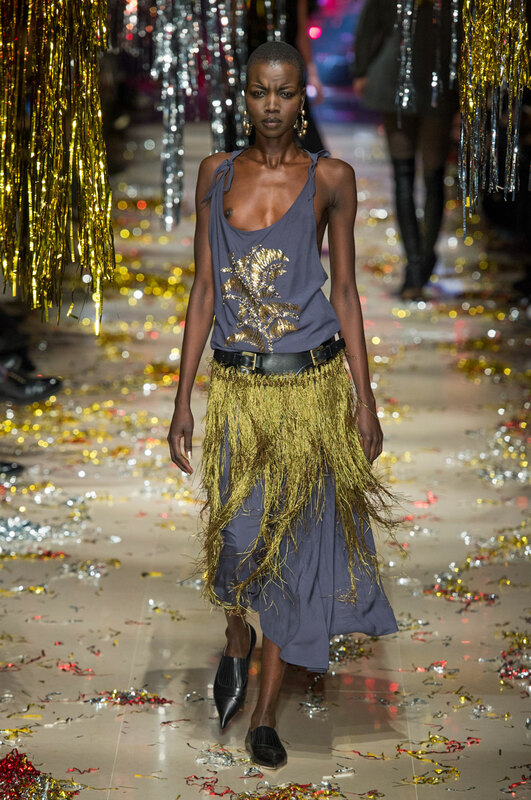 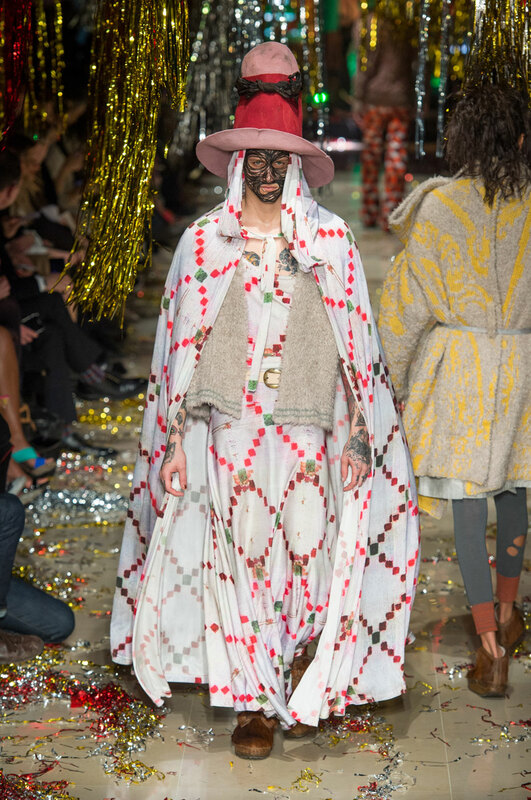 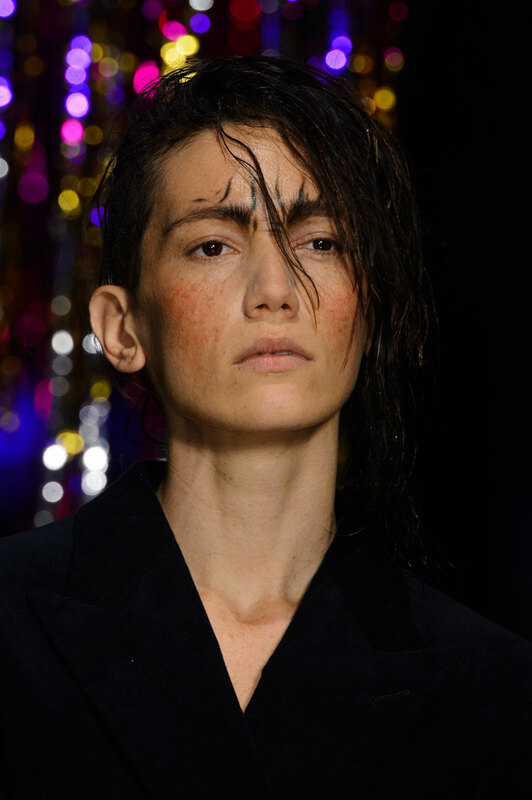 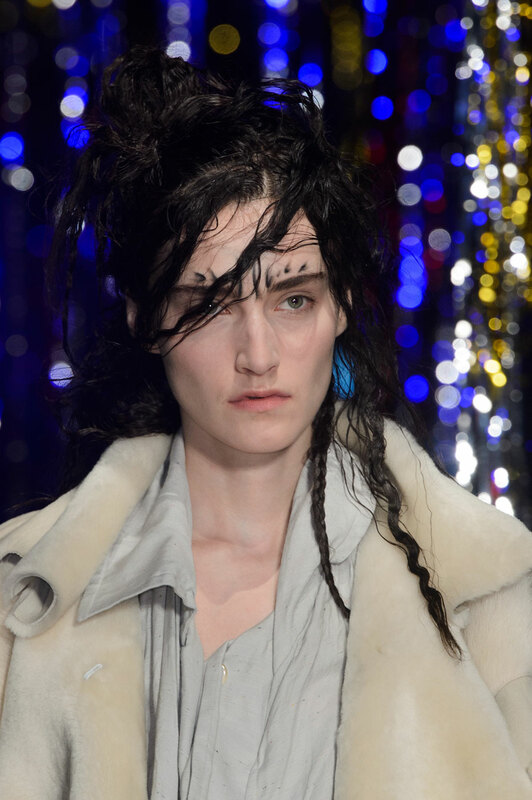 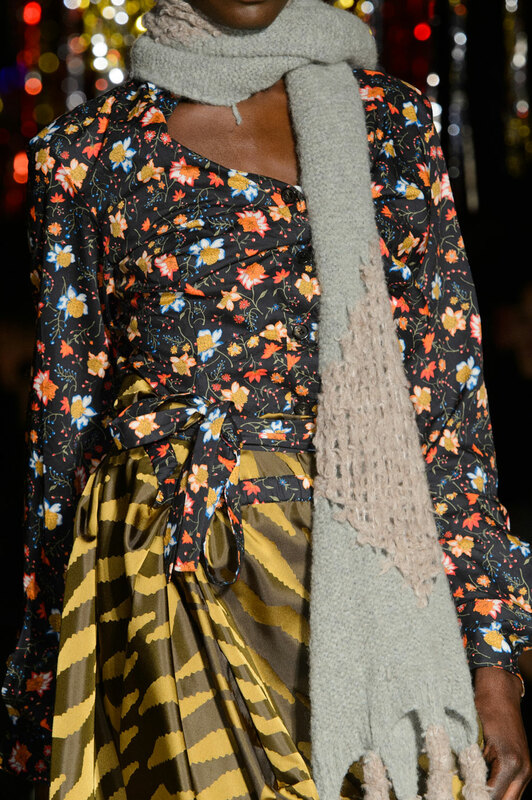 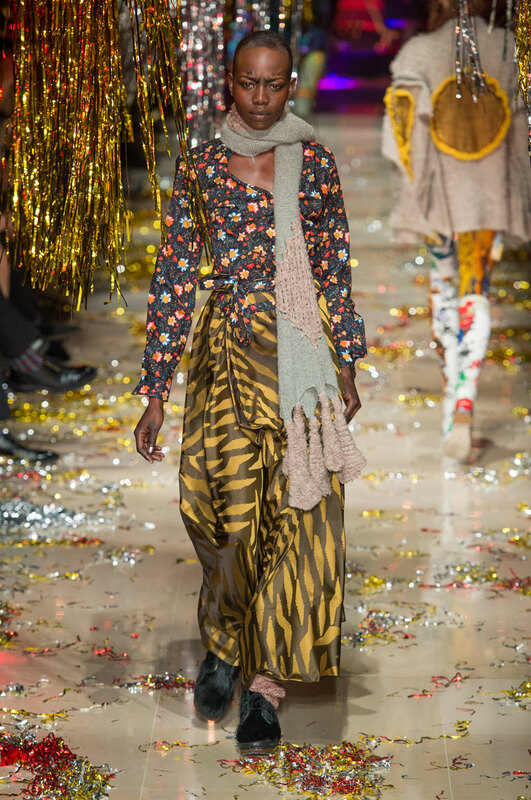 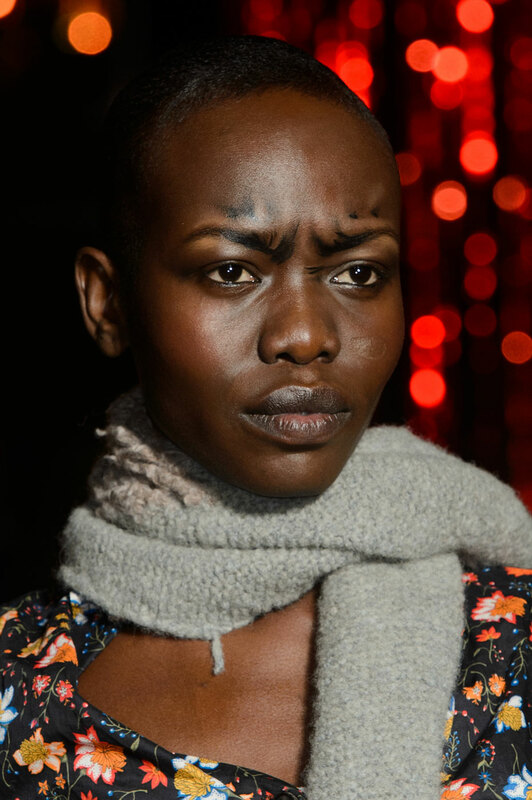 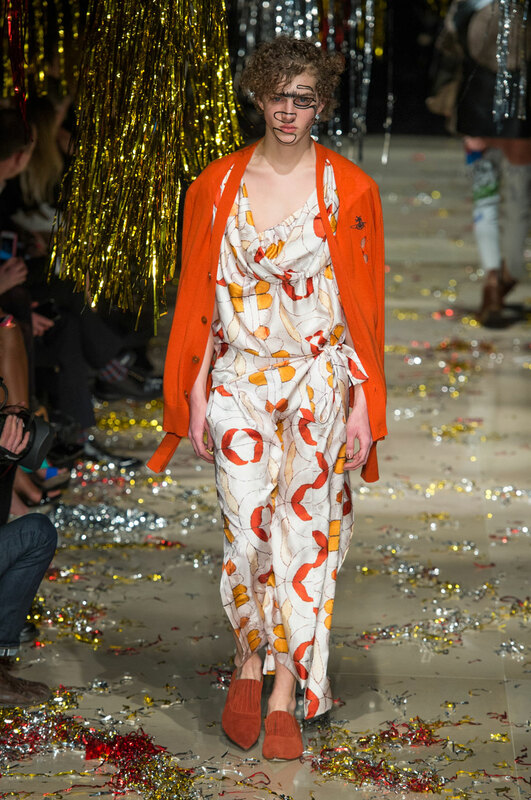 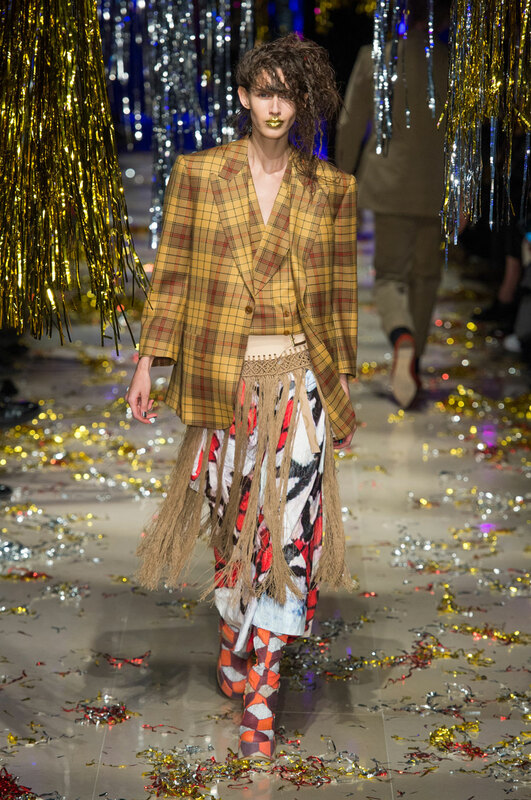 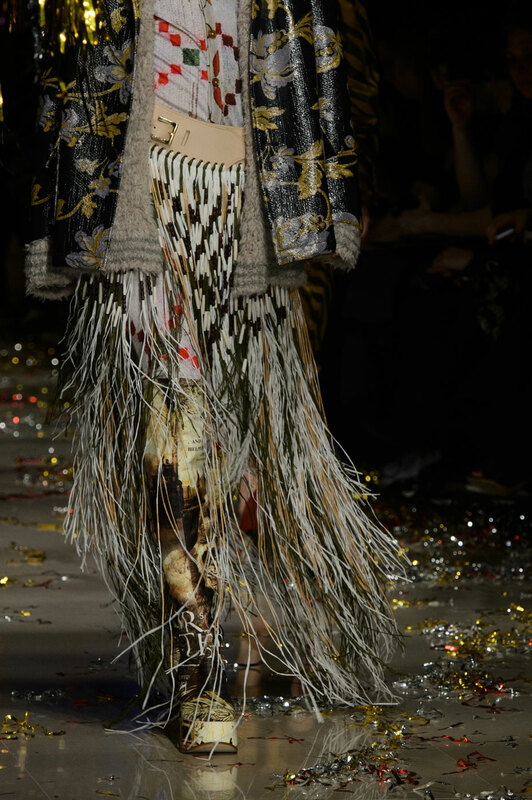 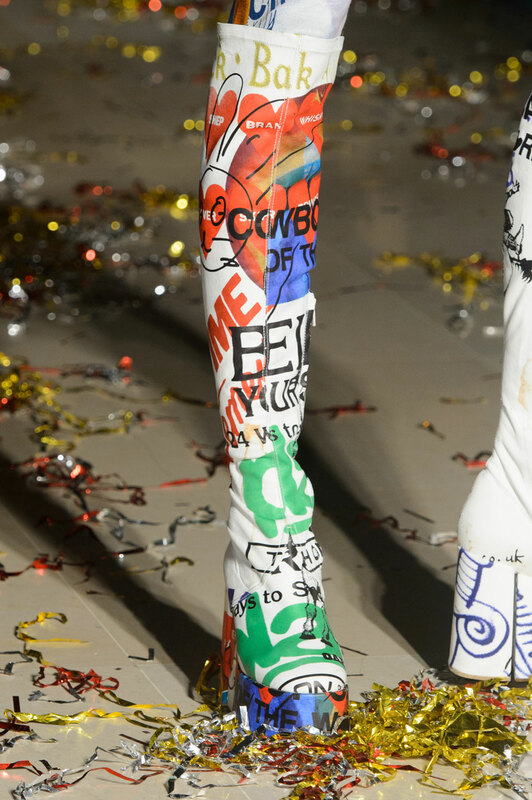 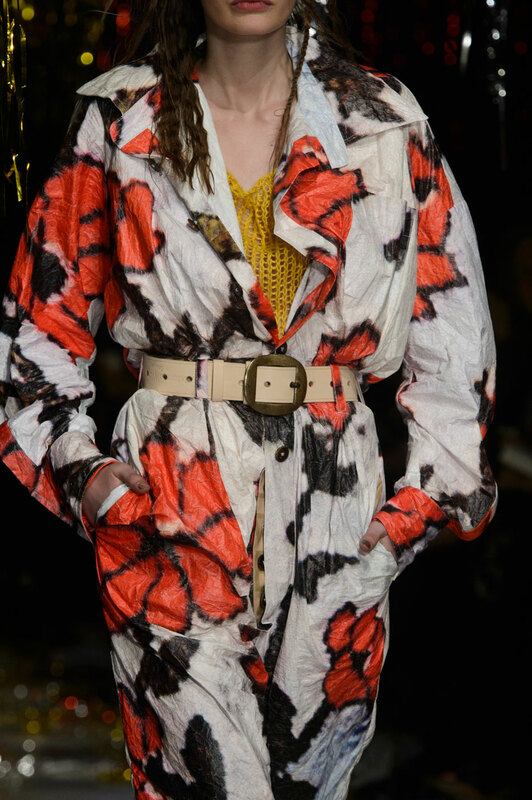 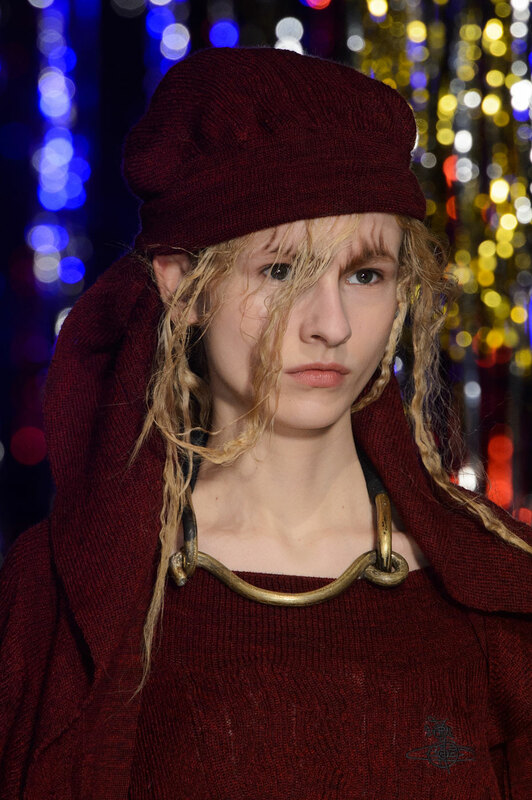 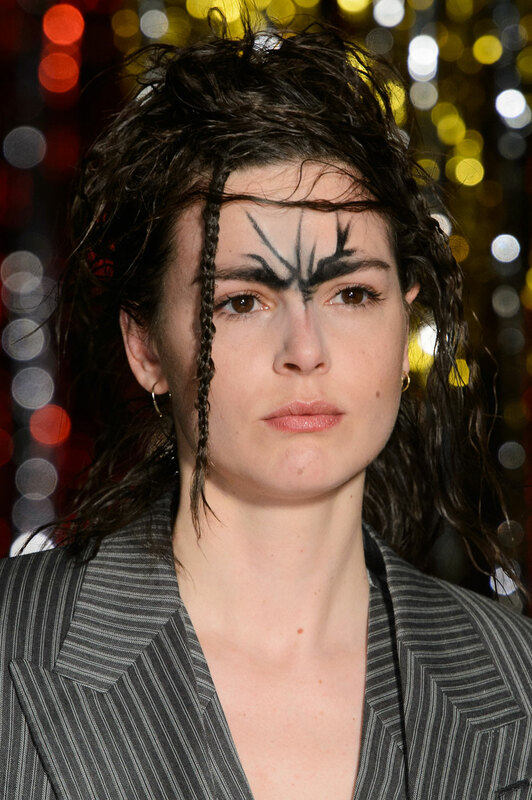 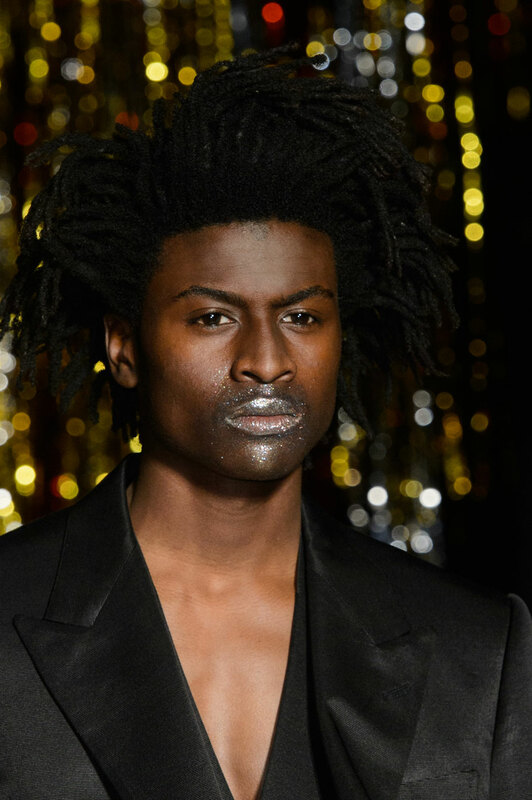 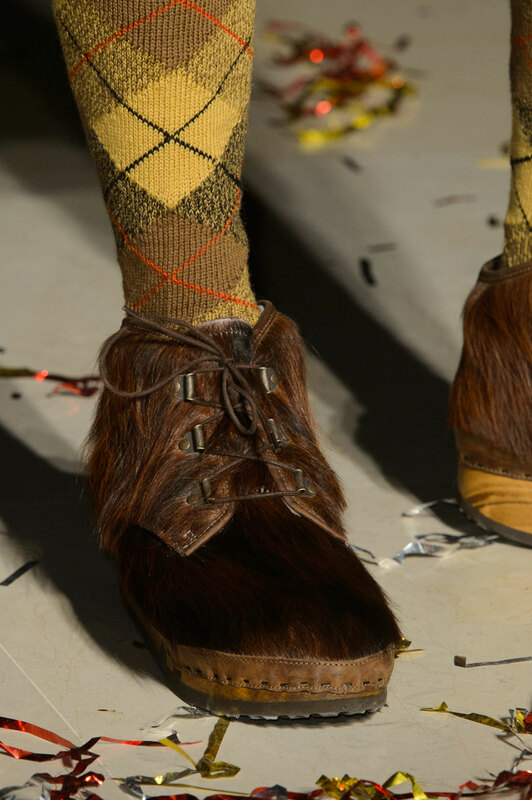 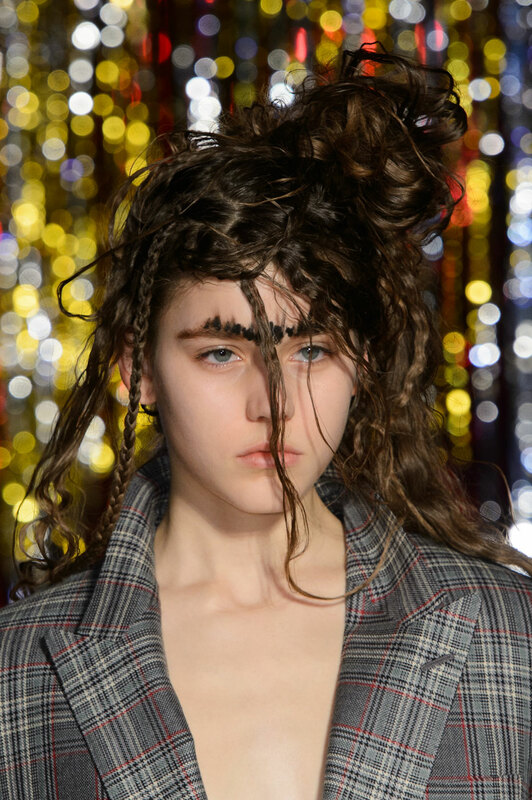 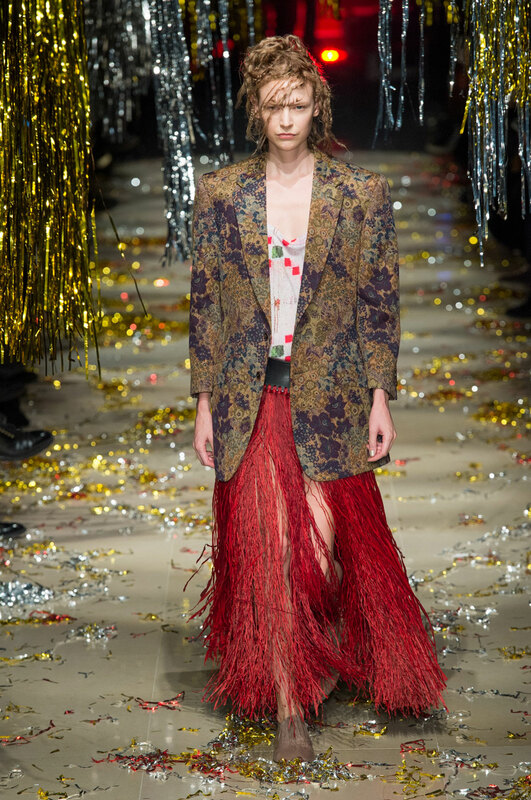 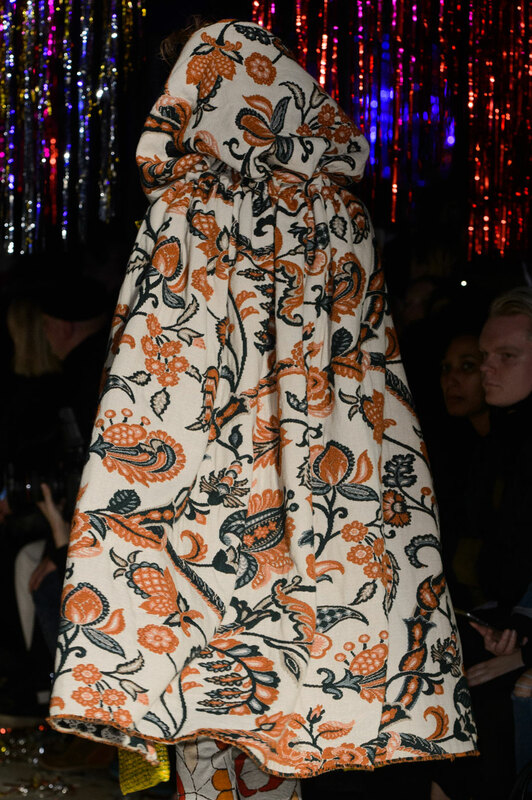 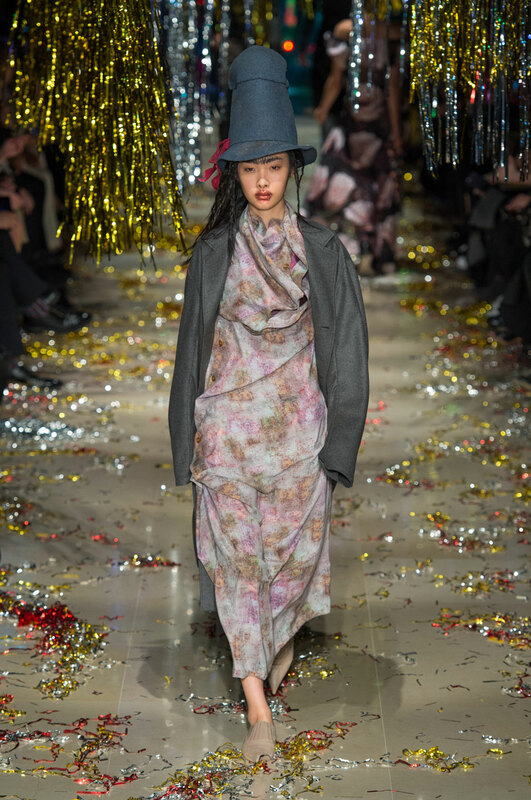 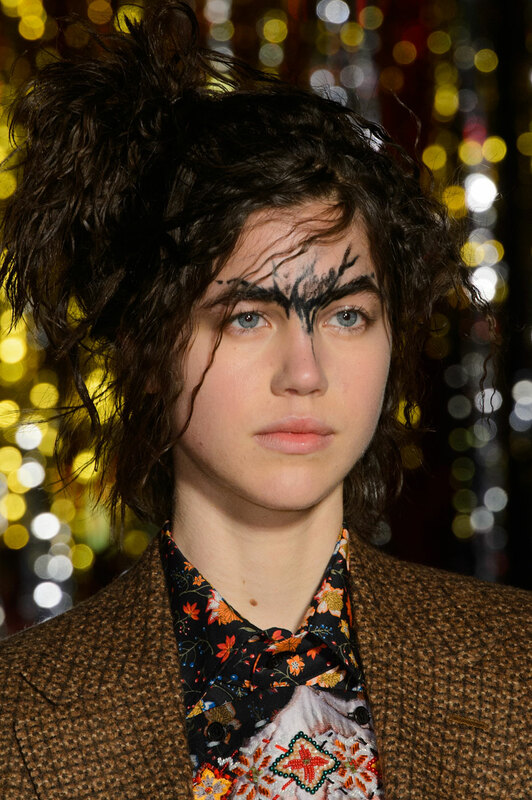 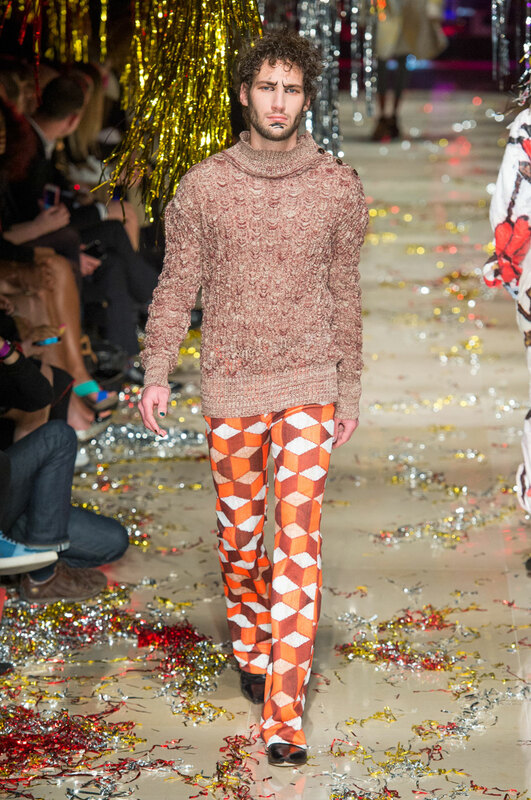 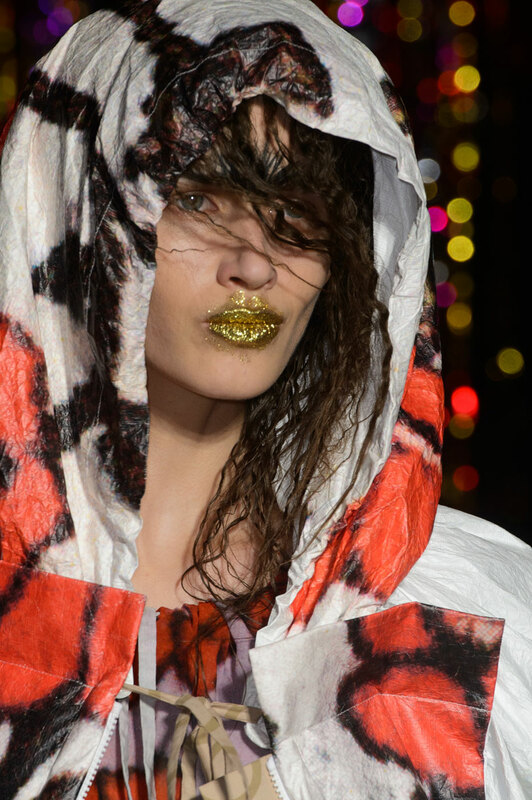 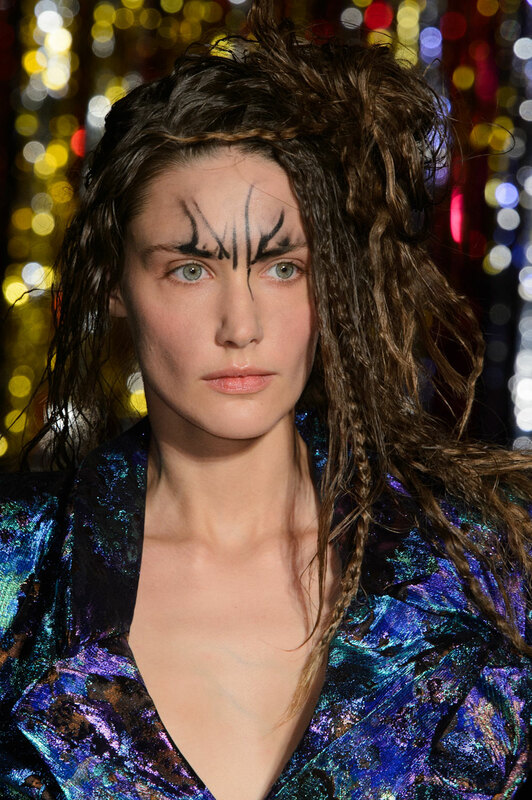 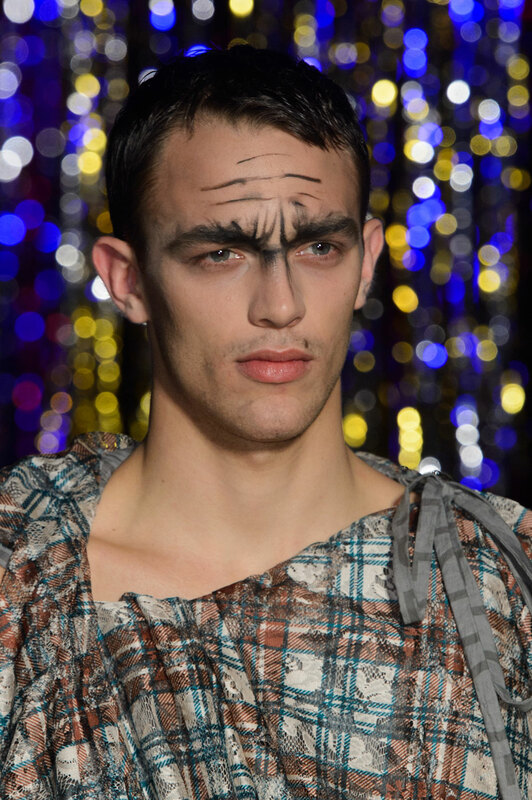 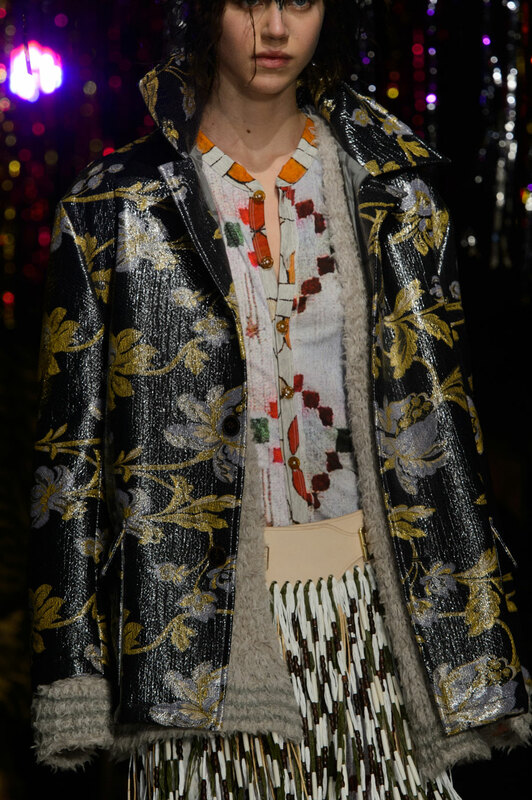 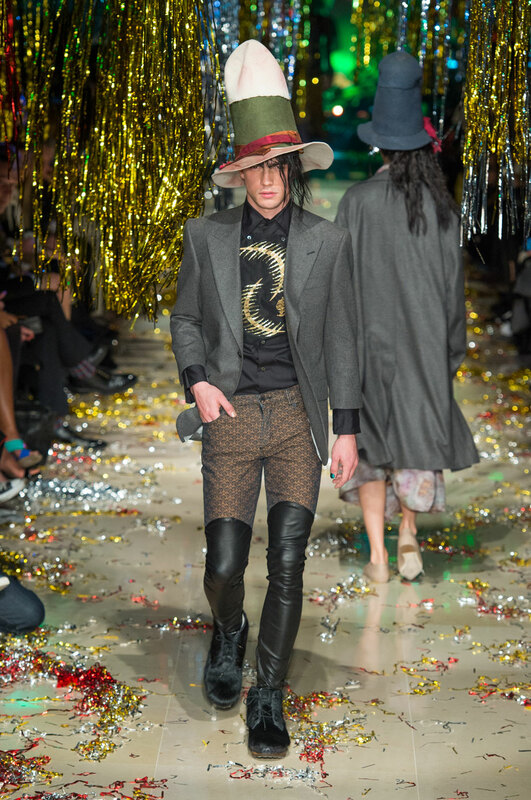 Vivienne Westwood Women Autumn-Winter 2015 – Vivienne Westwood had a message to send to the world with her AW15 collection and that message; subvert gender stereotypes. 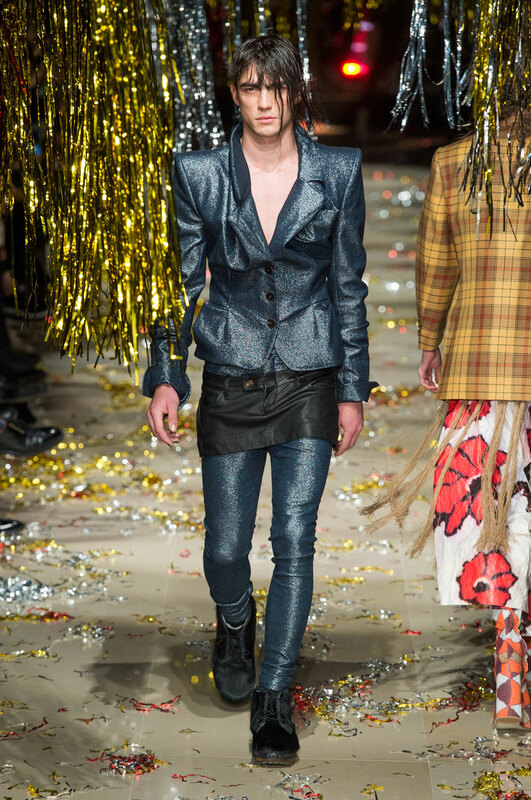 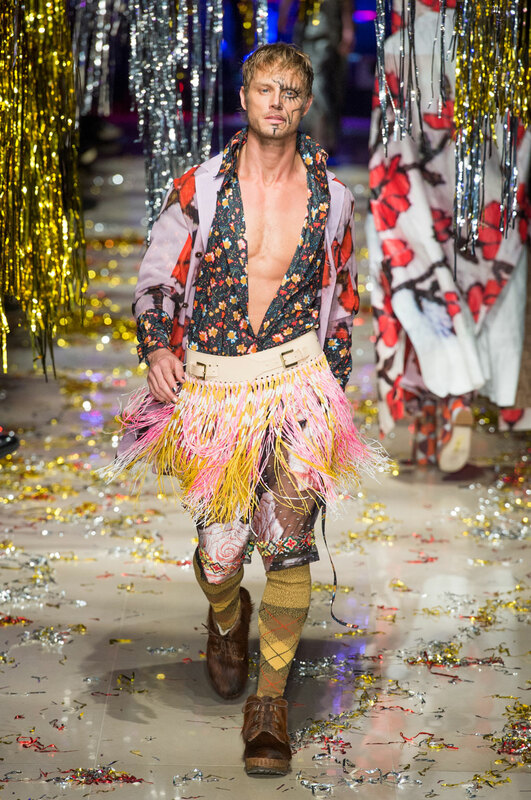 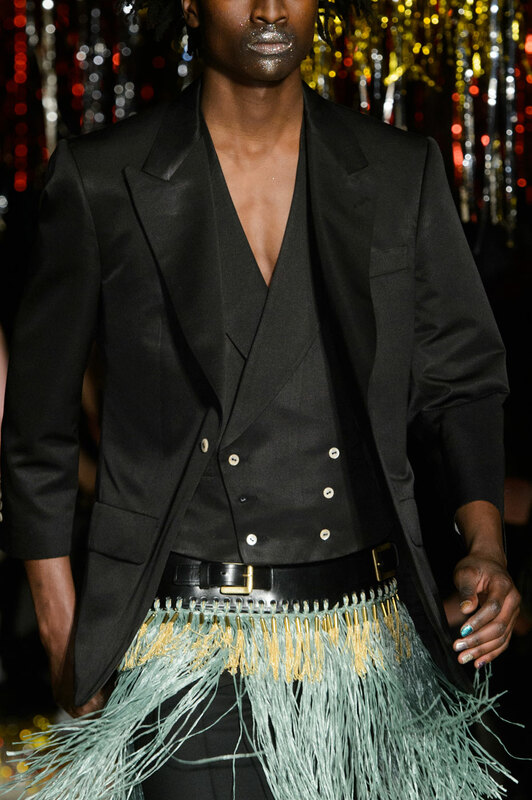 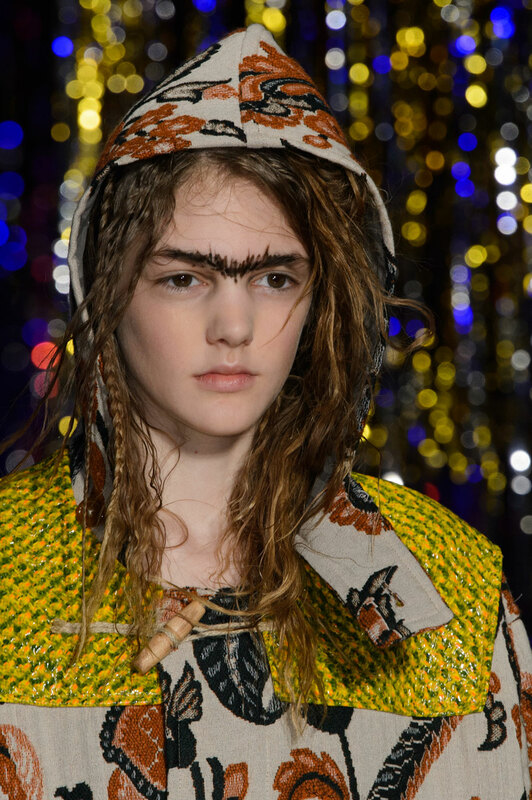 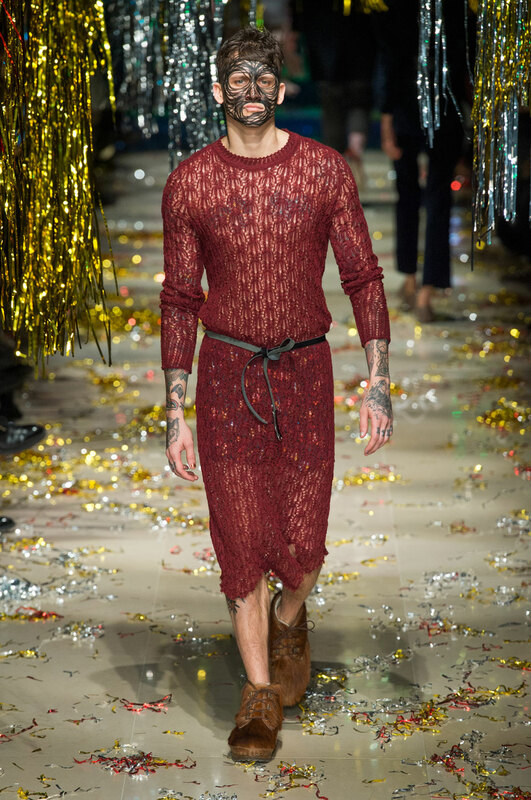 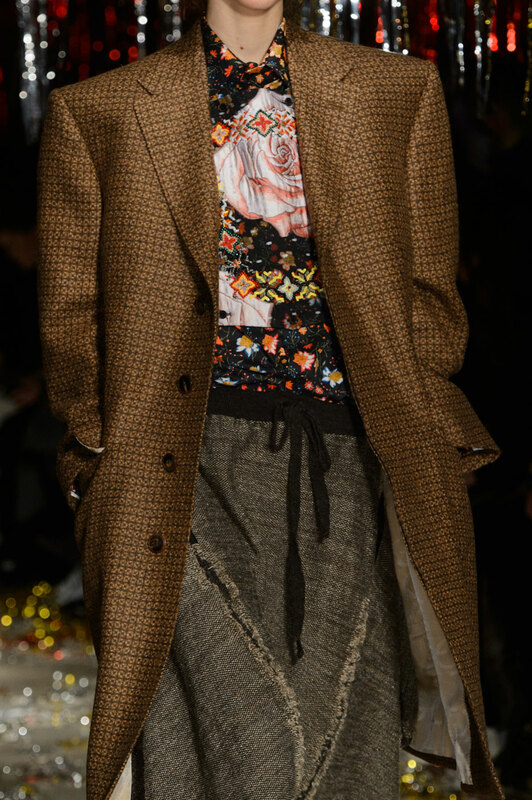 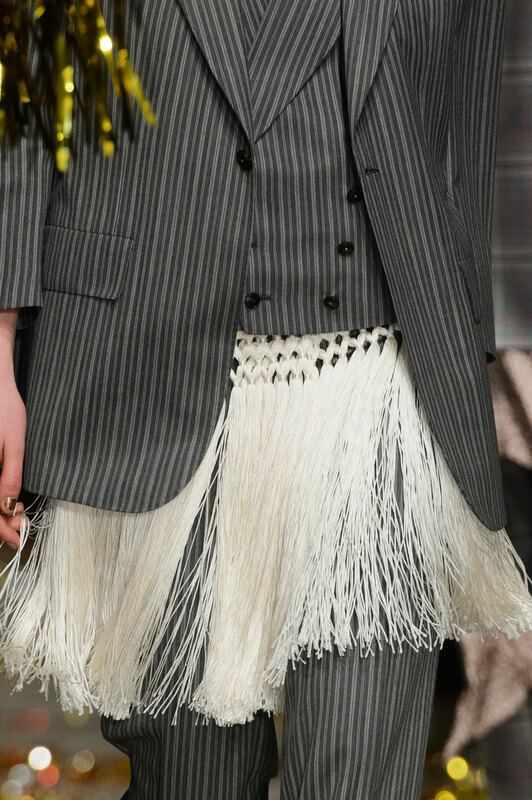 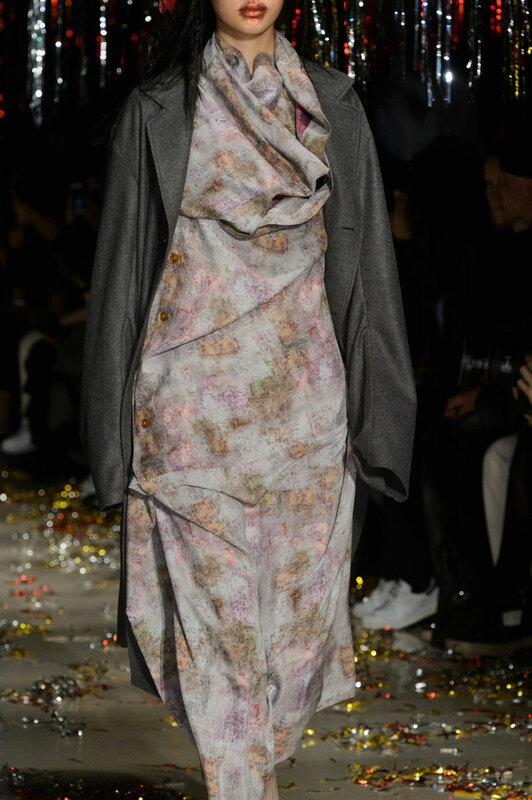 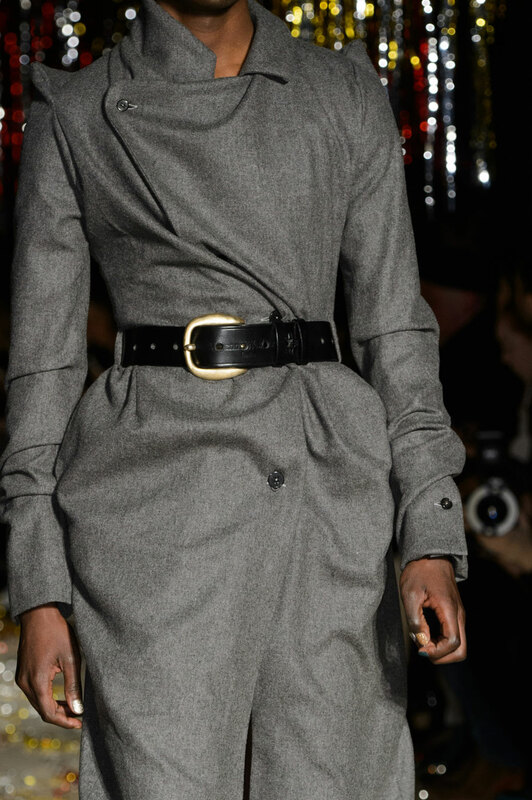 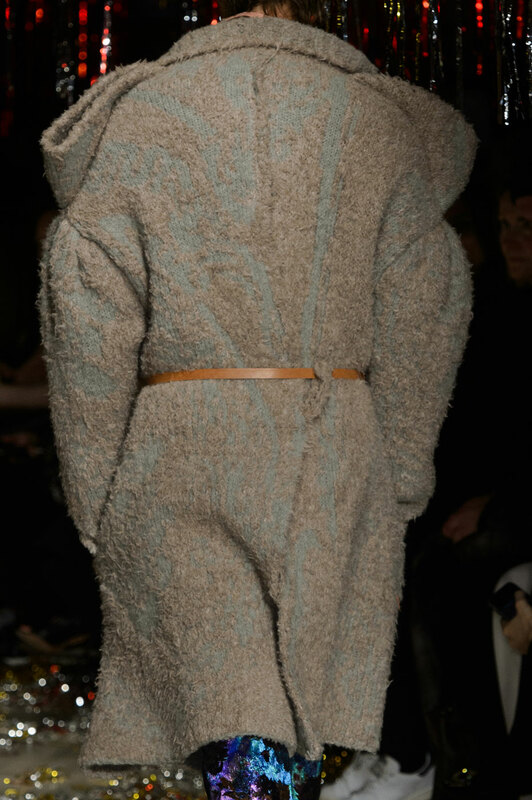 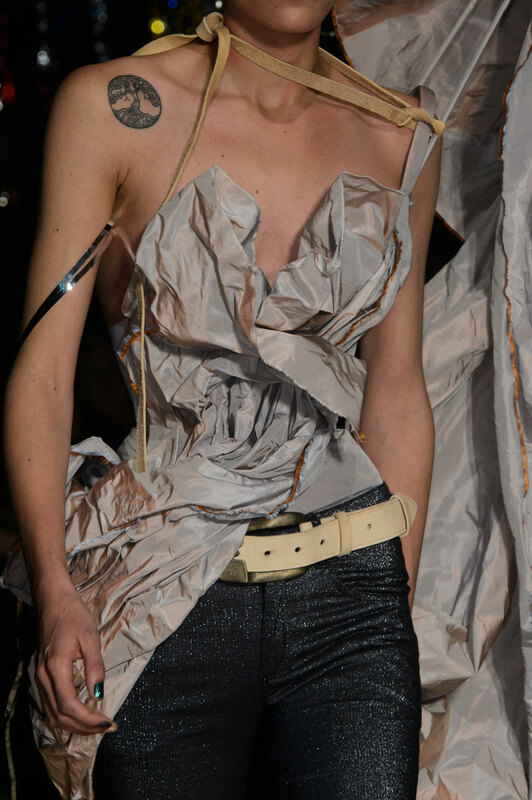 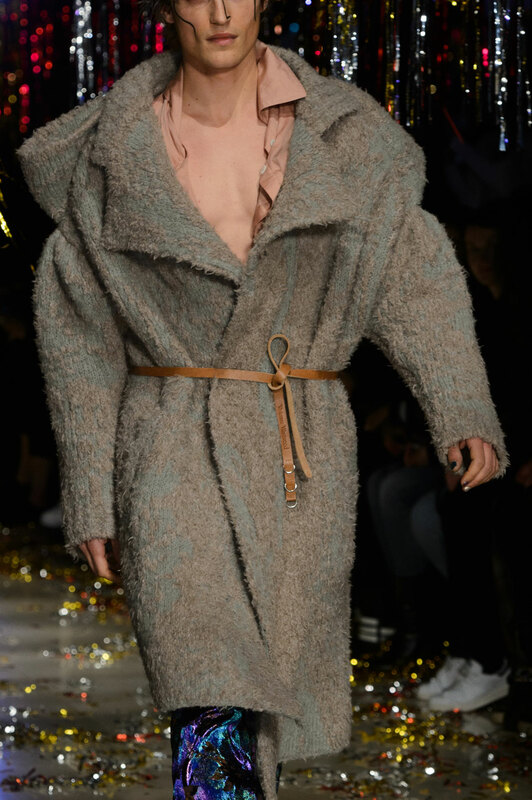 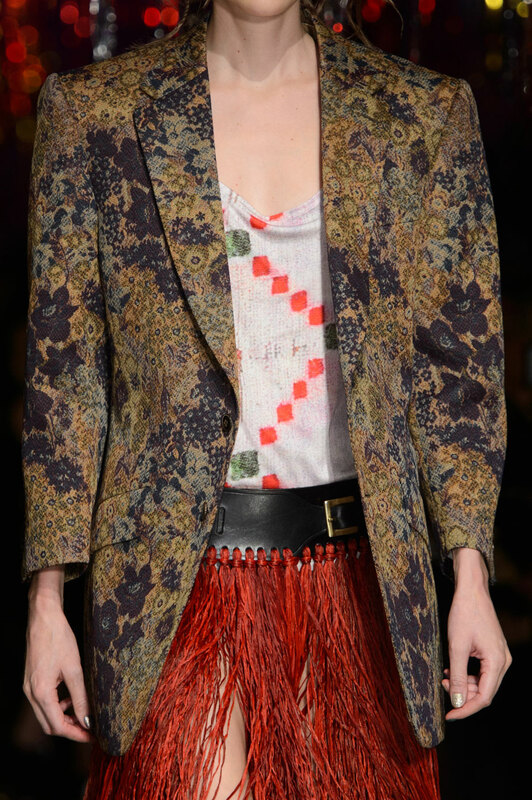 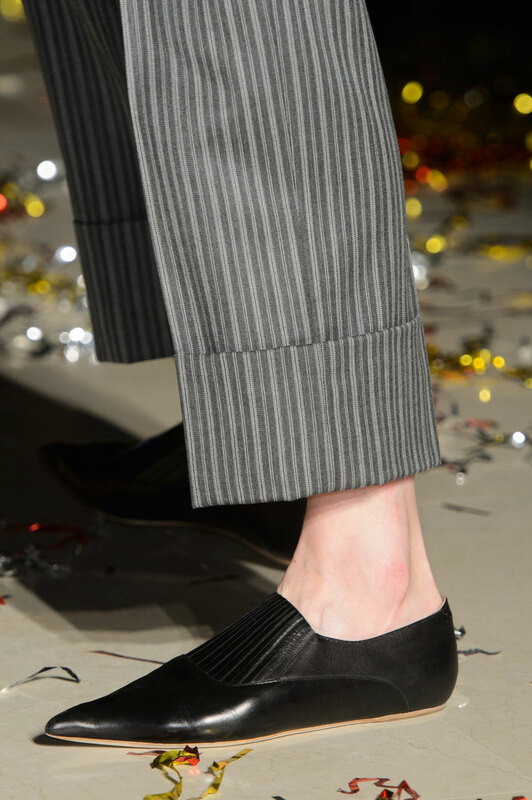 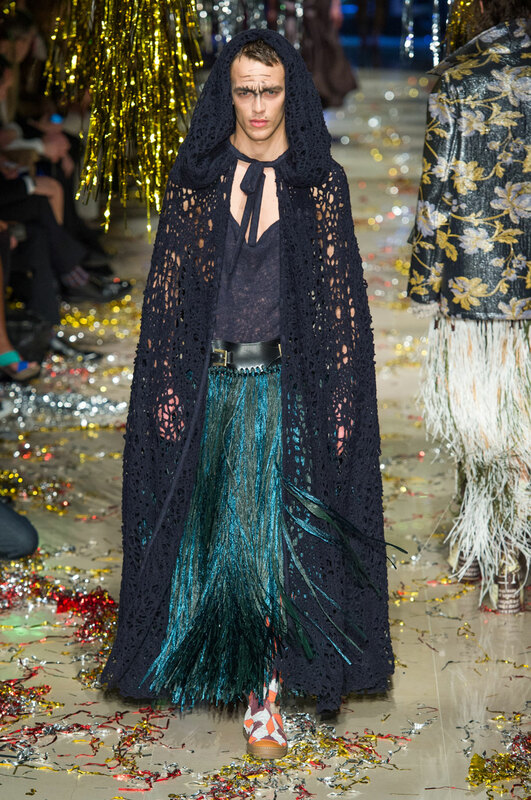 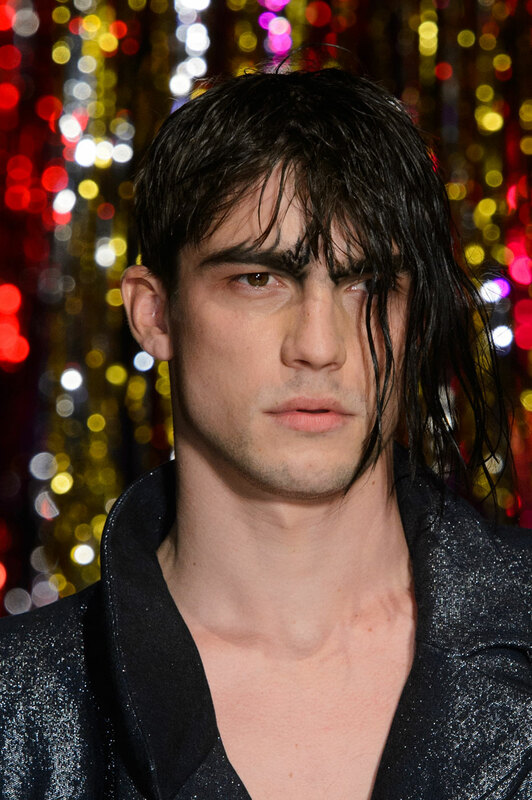 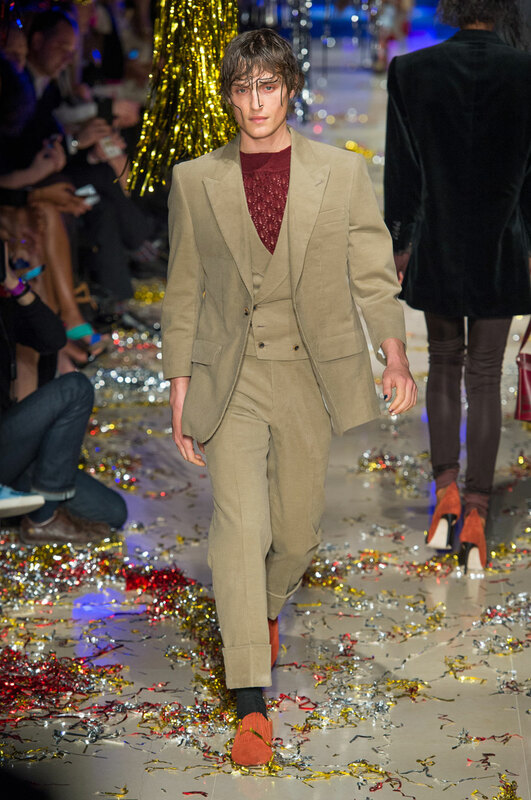 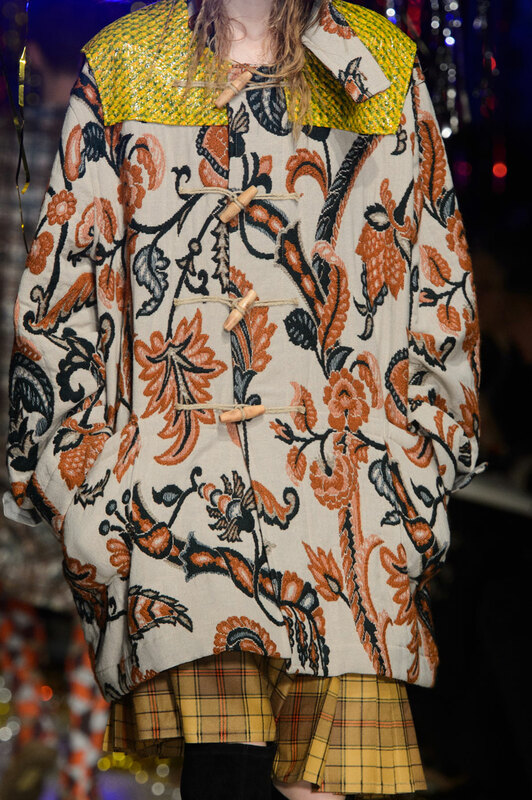 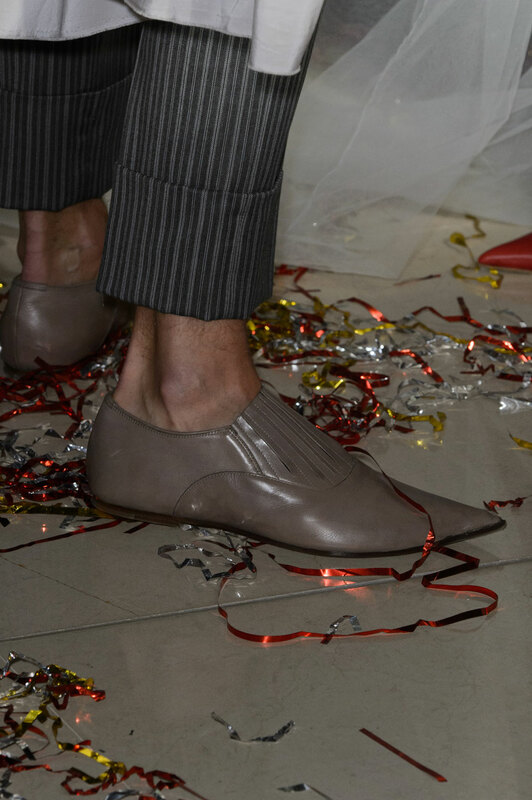 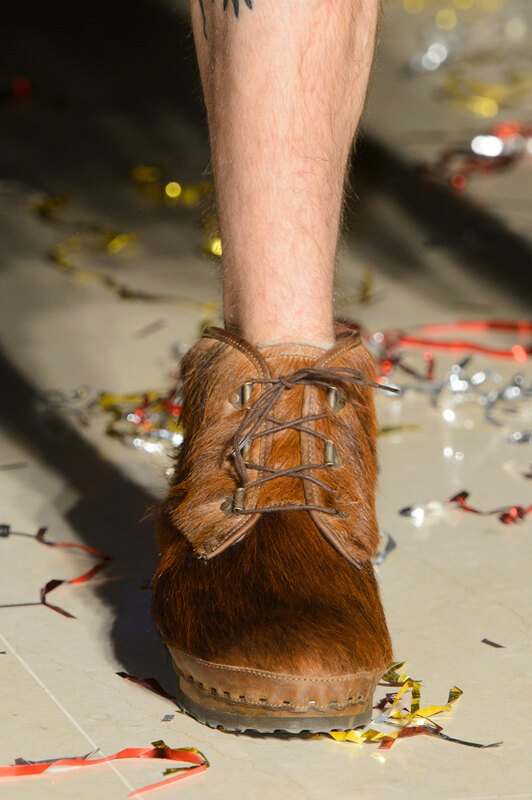 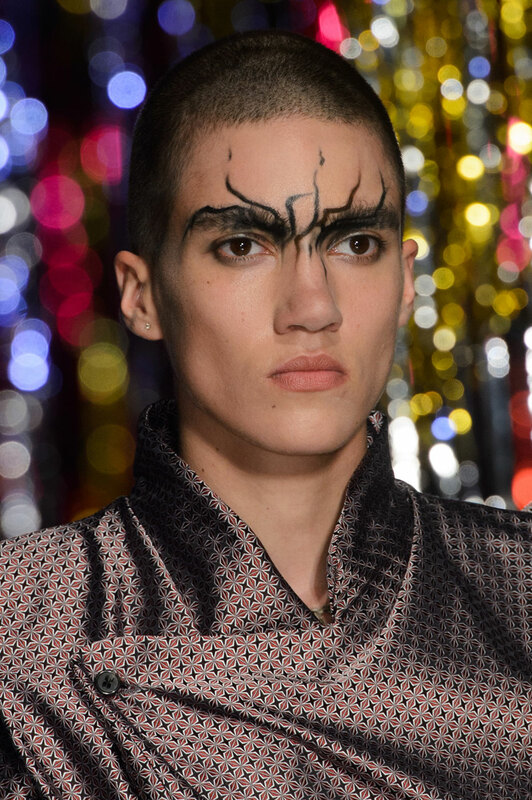 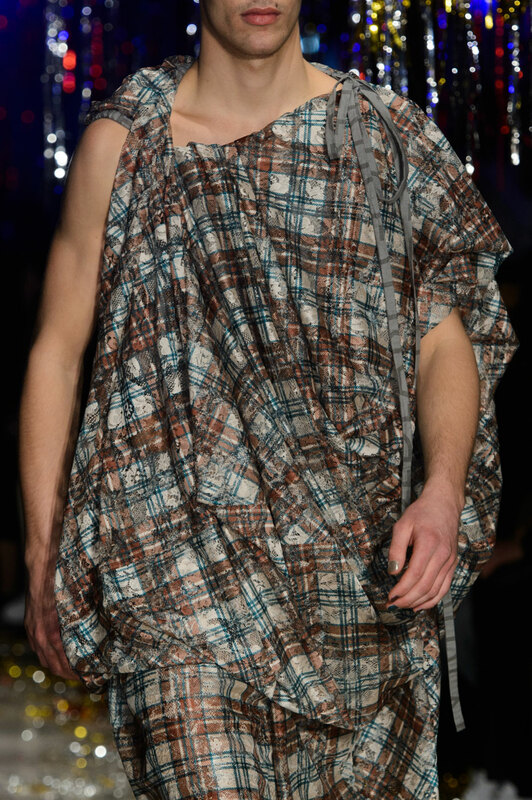 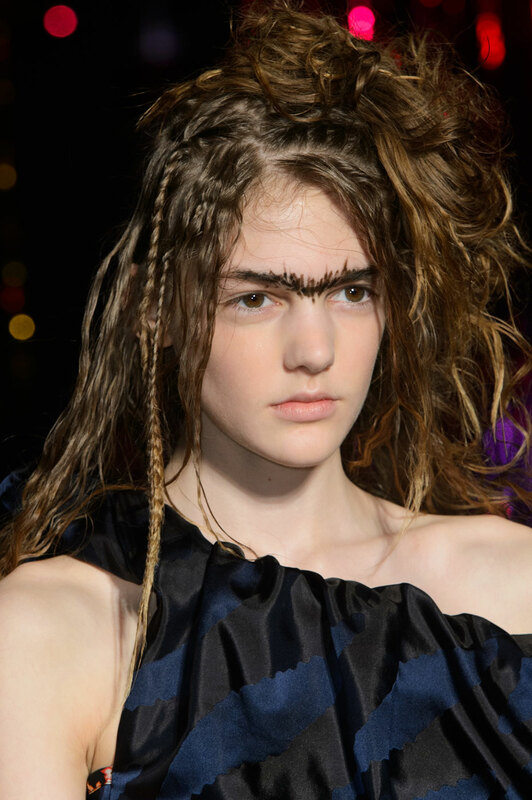 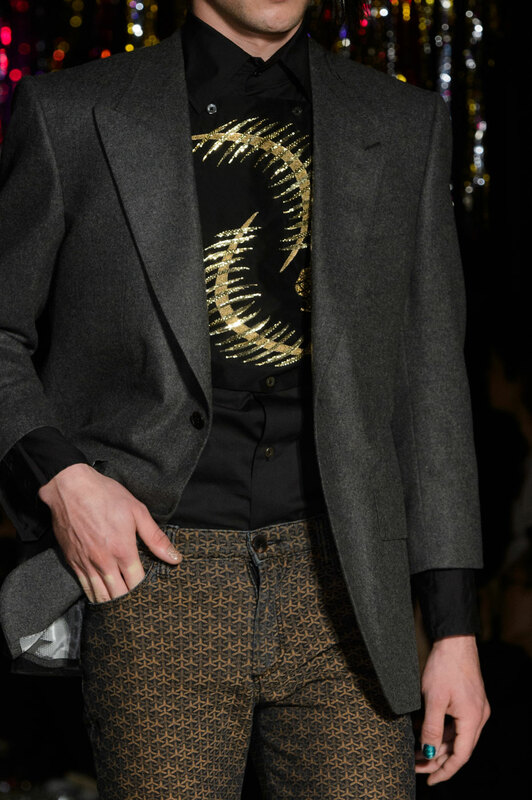 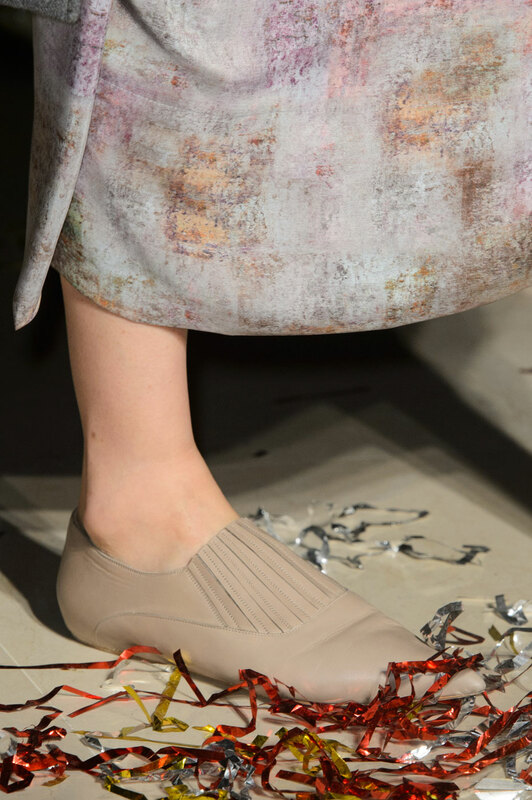 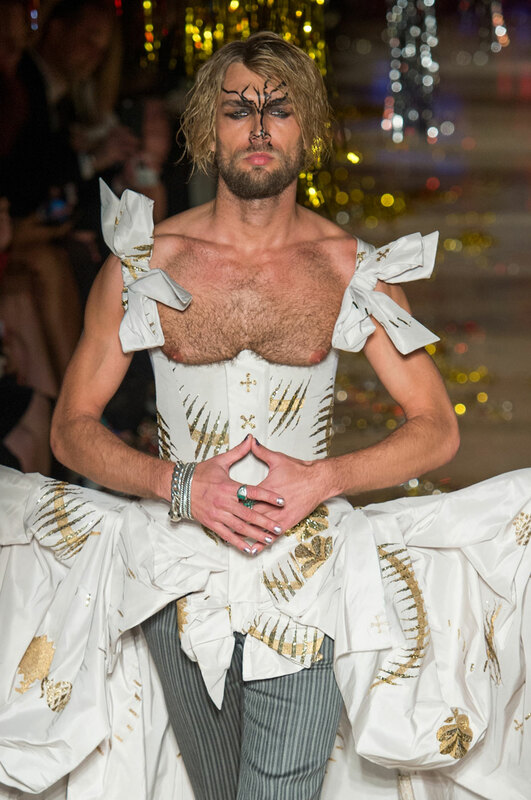 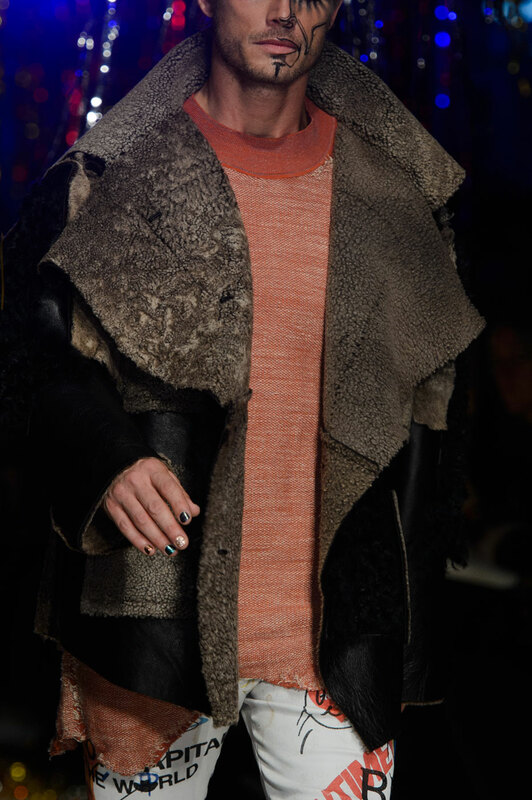 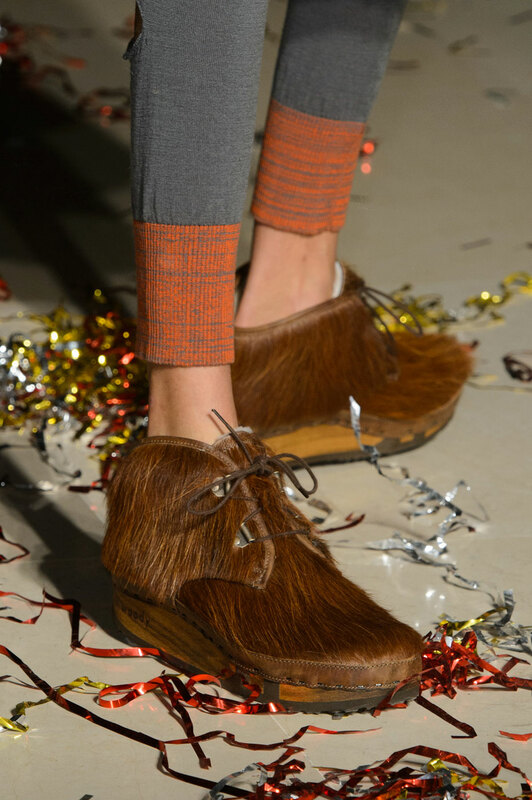 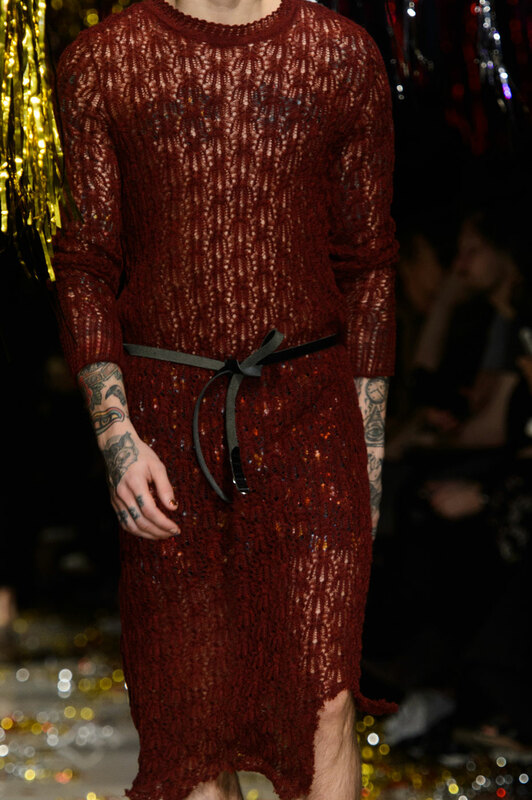 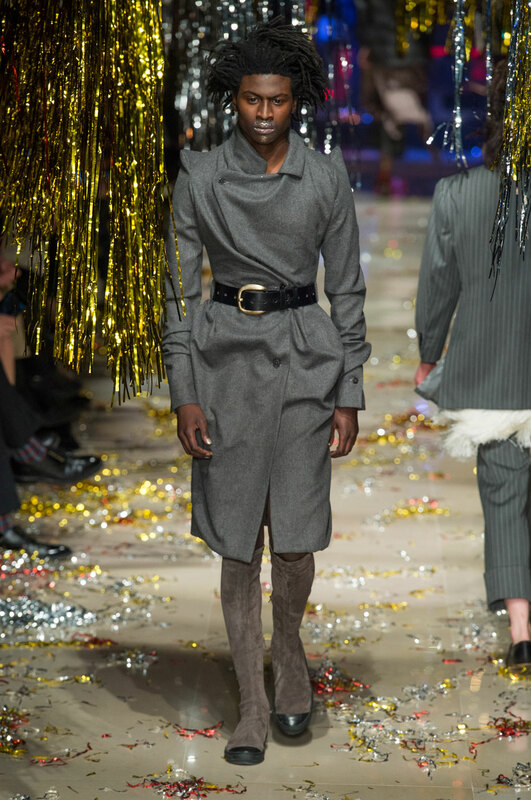 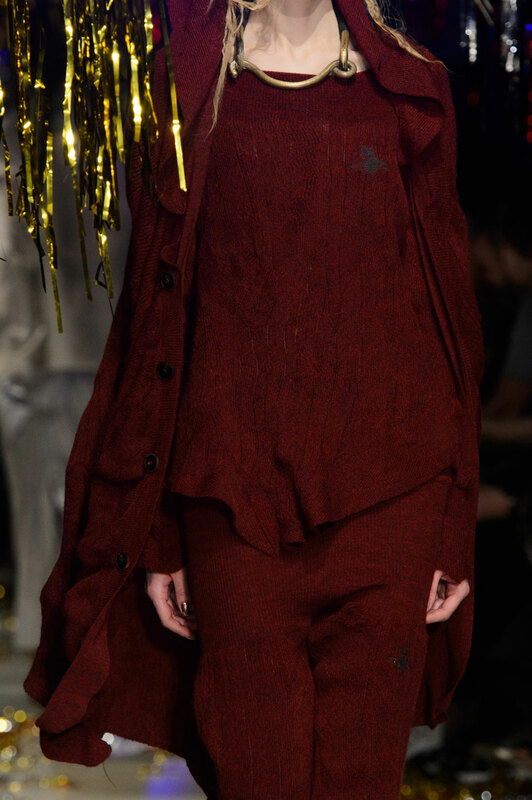 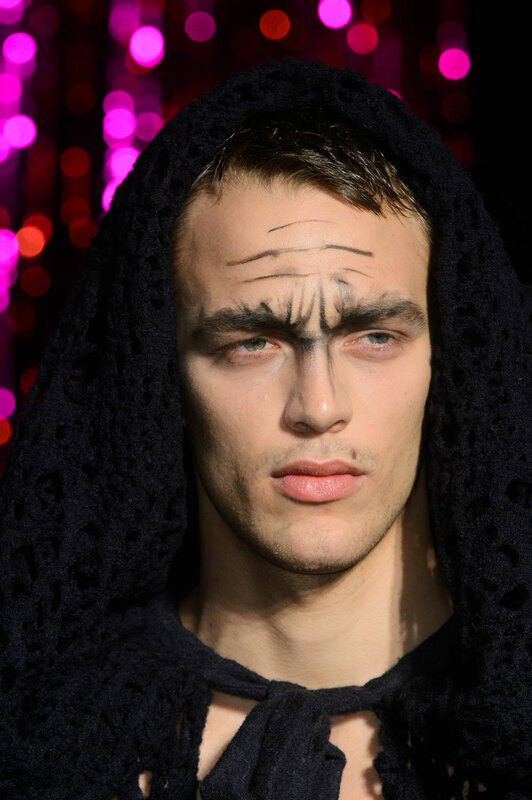 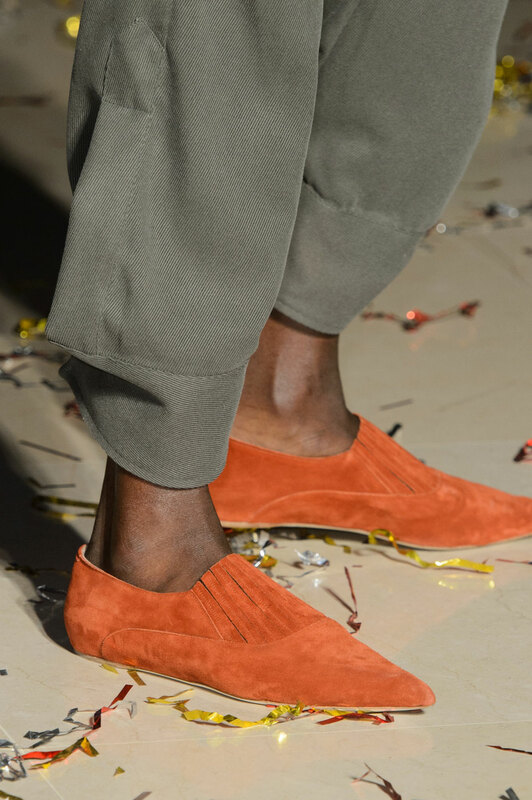 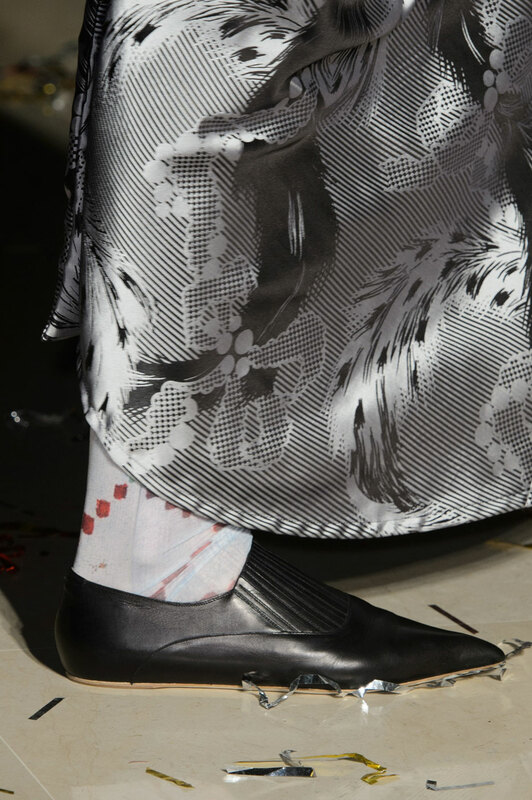 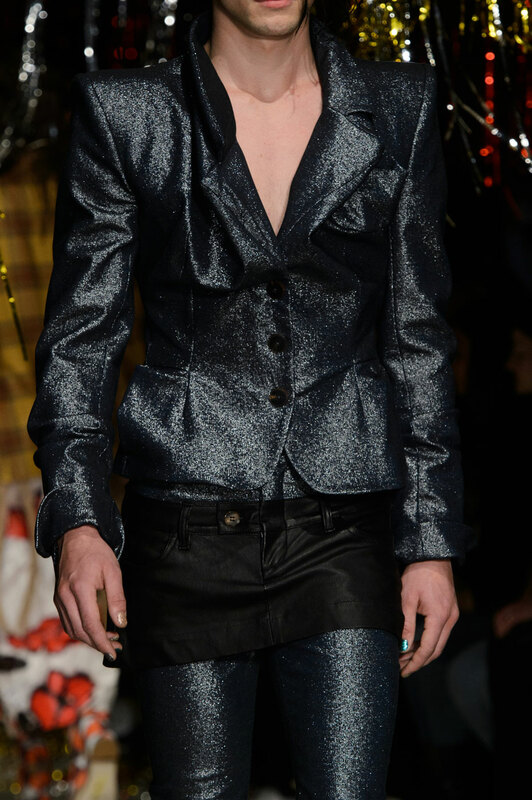 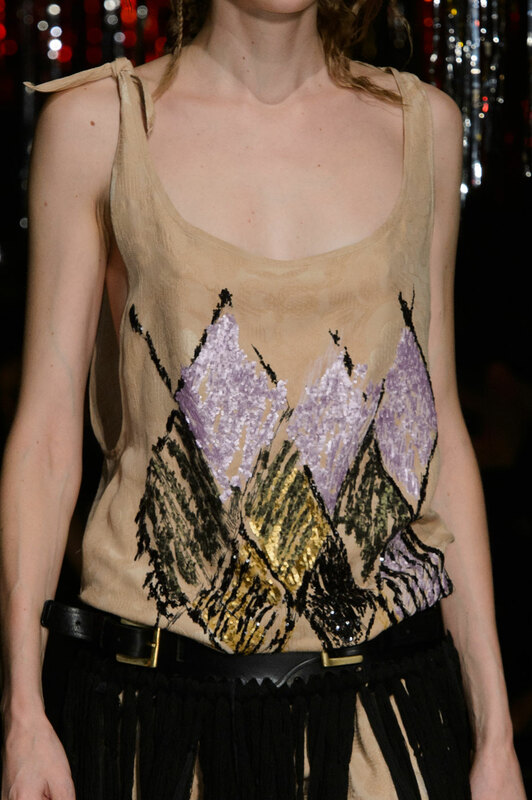 Passionate to gain awareness on unisex dressing, Westwood reversed the gender roles on the catwalk. 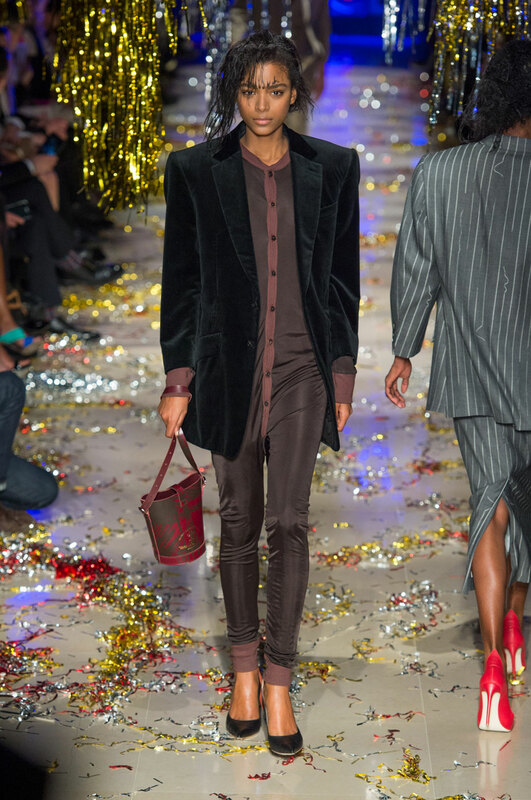 Woman wore boxy suits whilst the men squeezed into dresses and tunics. 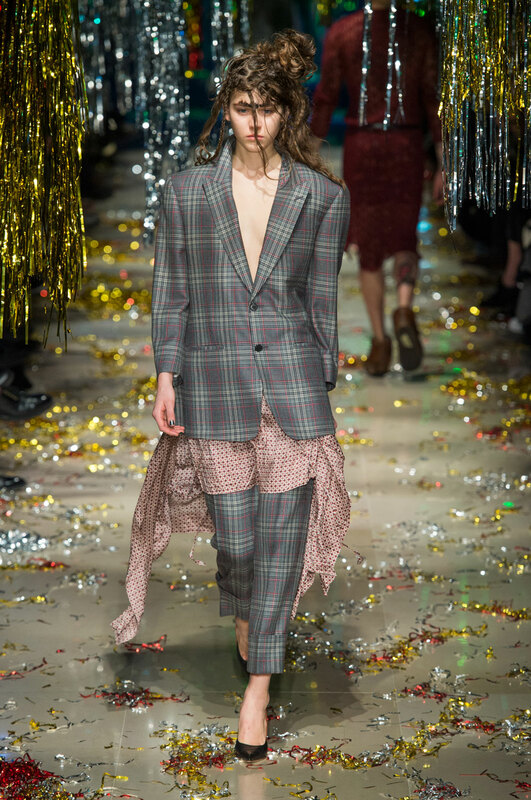 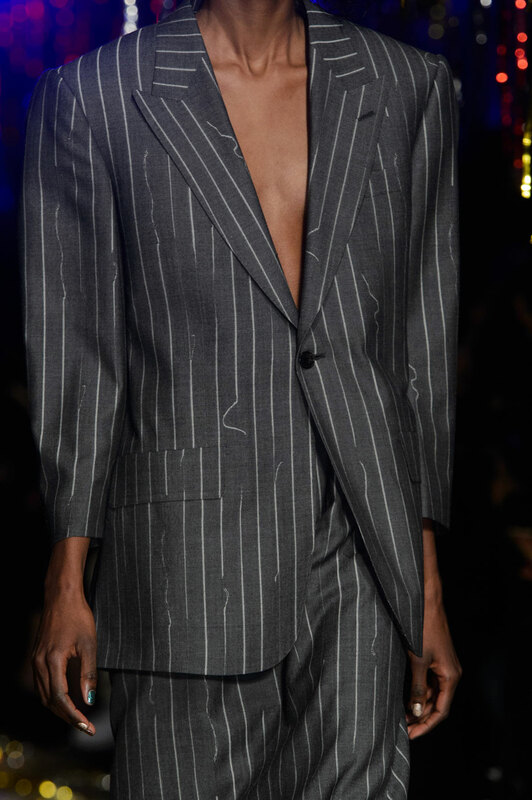 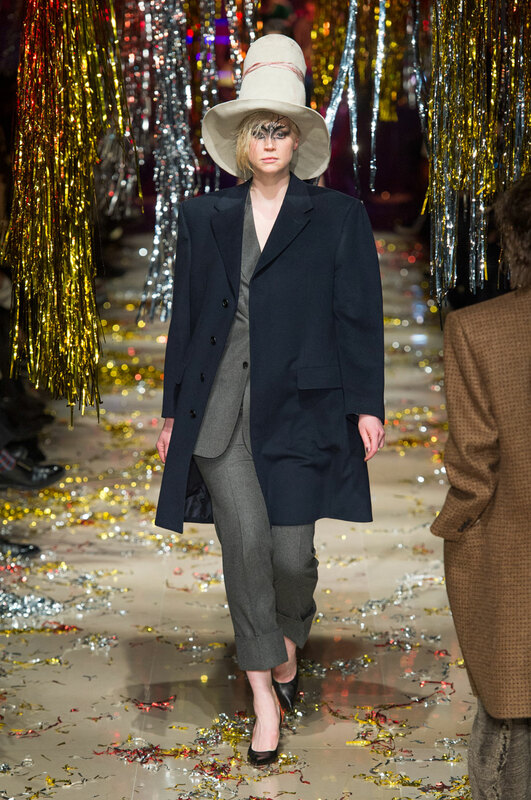 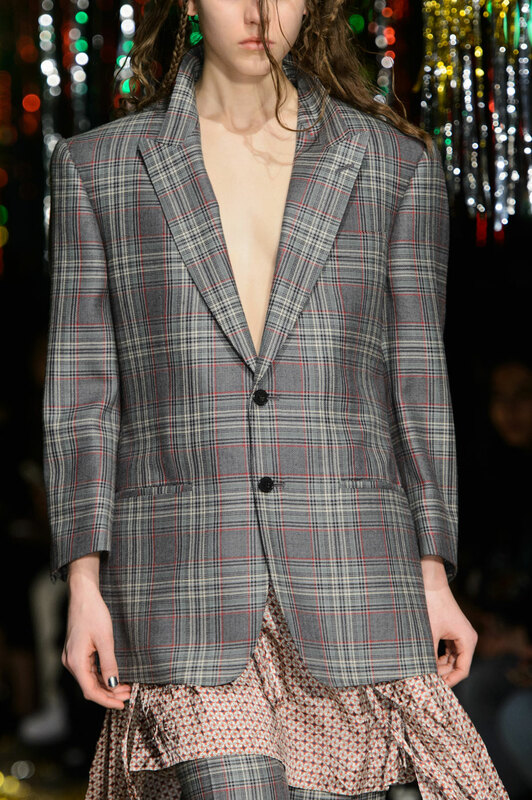 The tailoring was powerful; oversized silhouettes, broad prominent shoulders and large cuffed trousers showed women can be just as powerful as men. 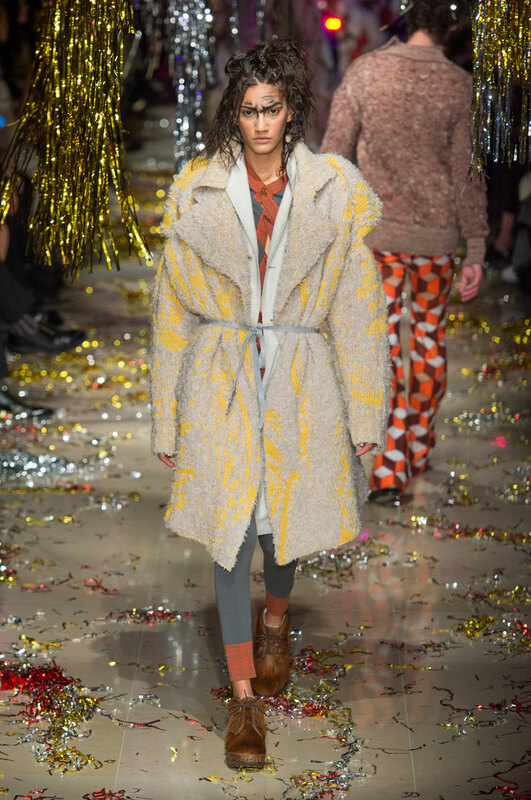 A reoccurring heavy knit motif made an appearance in different forms, from coats to cardigans made from bio-friendly sheep’s wool. 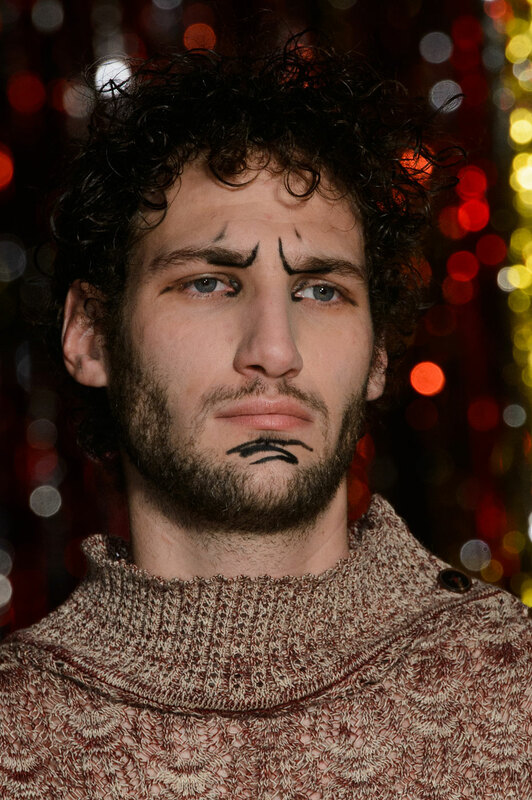 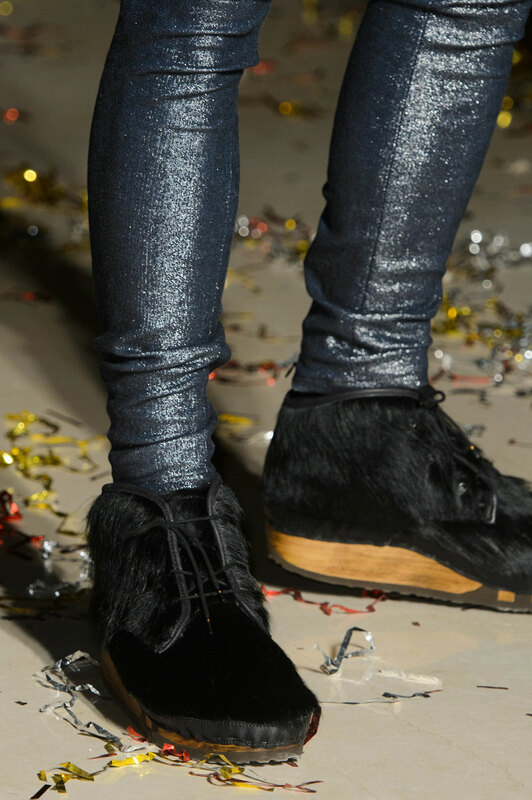 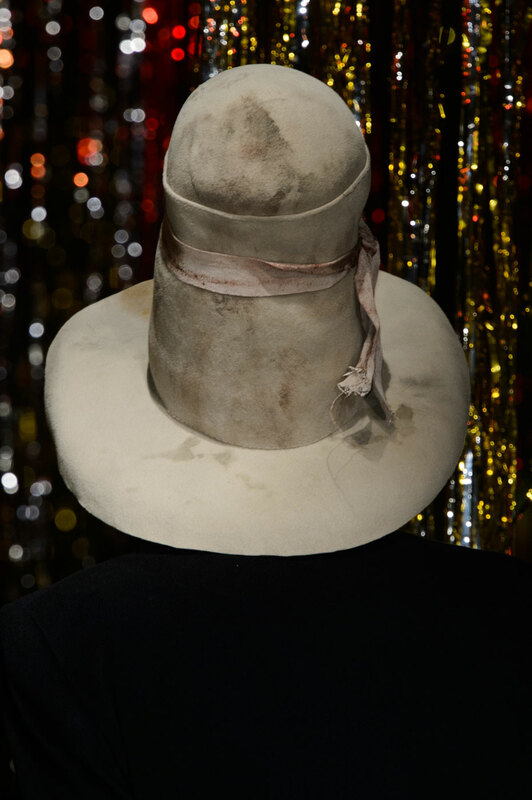 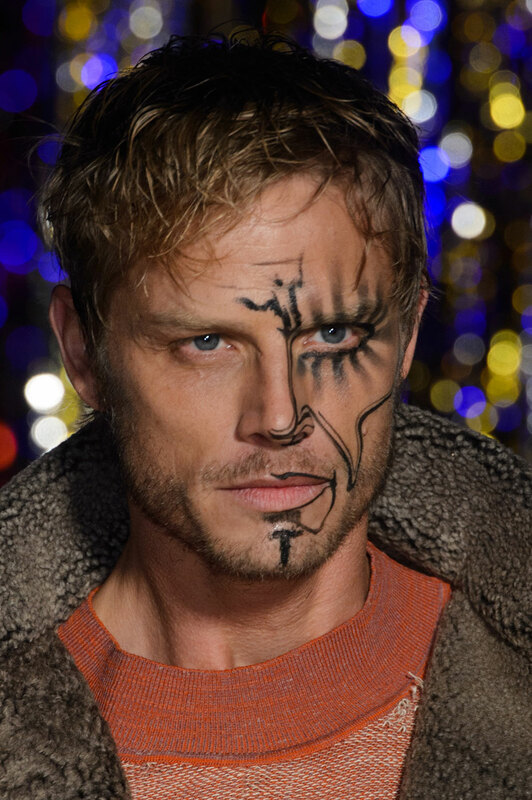 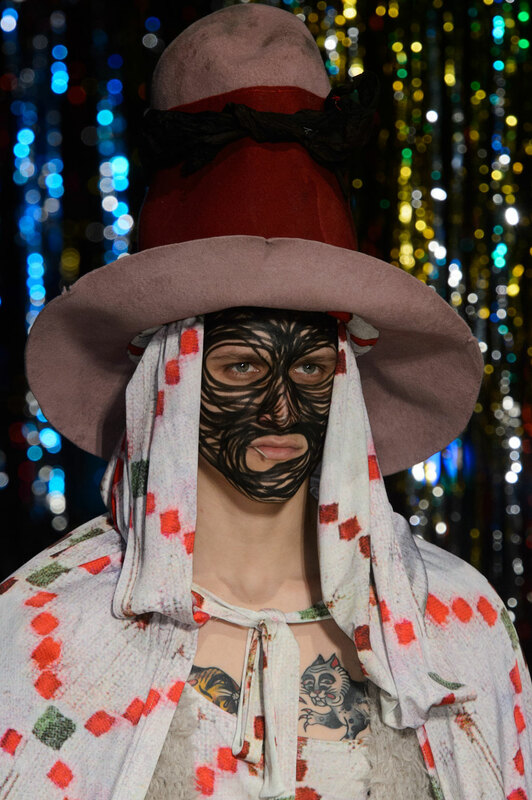 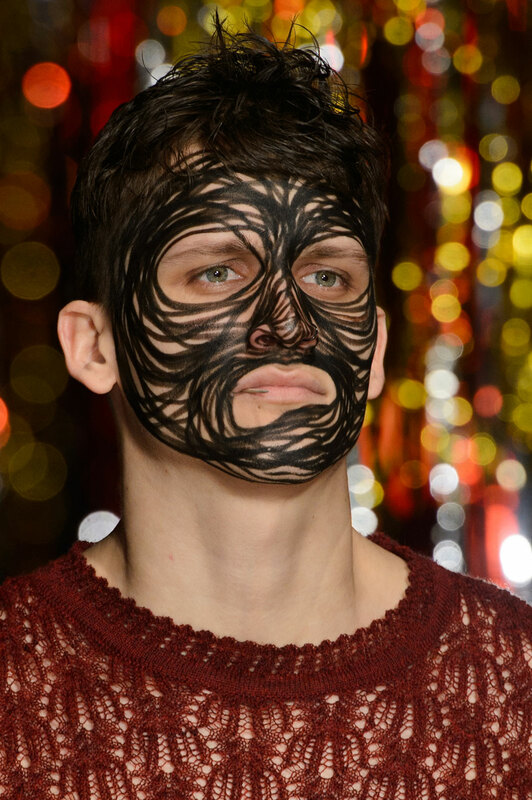 The show was consequently called Unisex and approached dressing as “grab the first thing and wear it.” In this case, it was the morning after the night before situation, with the tinsel party decorations and scribbled marking on faces you gain when falling sleep in near distance of a sharpie. 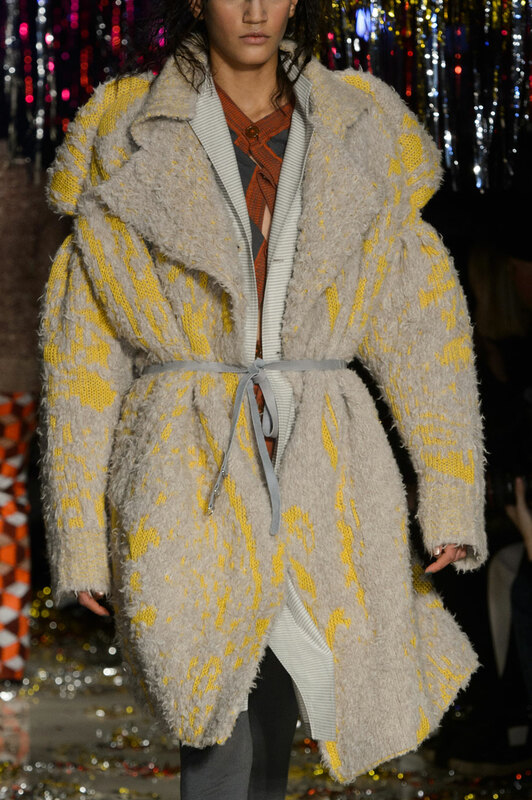 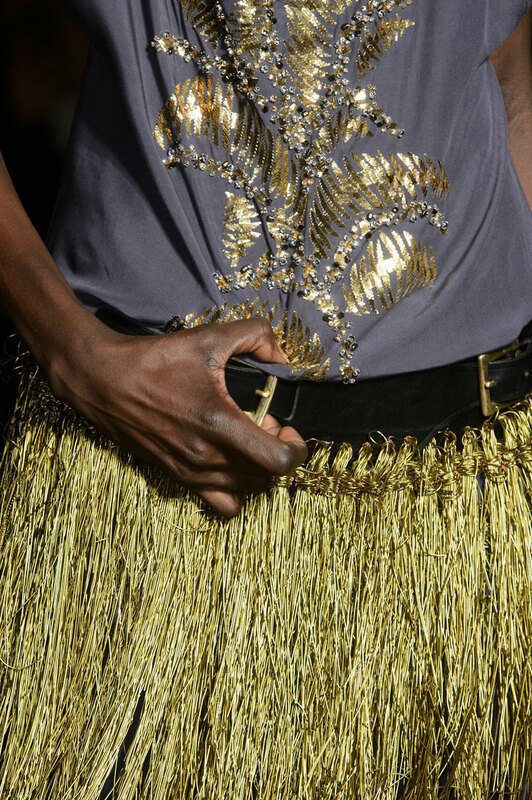 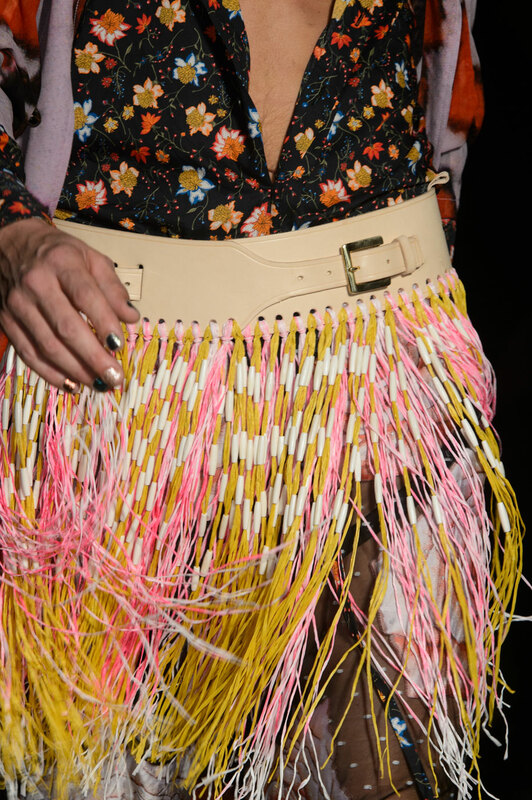 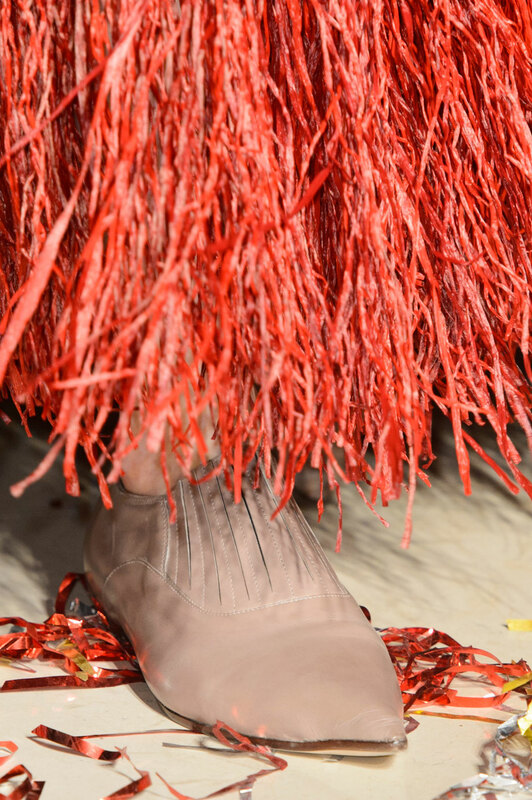 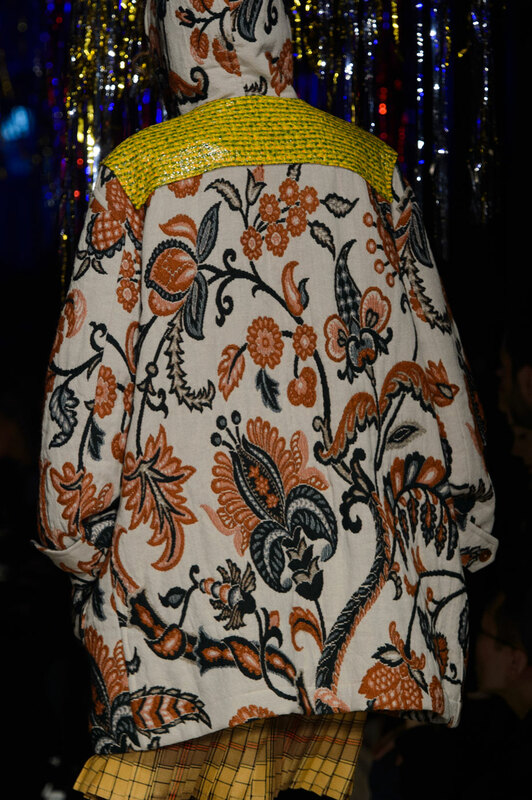 The colour palette of the collection was that of many colours, blue, pink, white, black, orange, yellow and green. 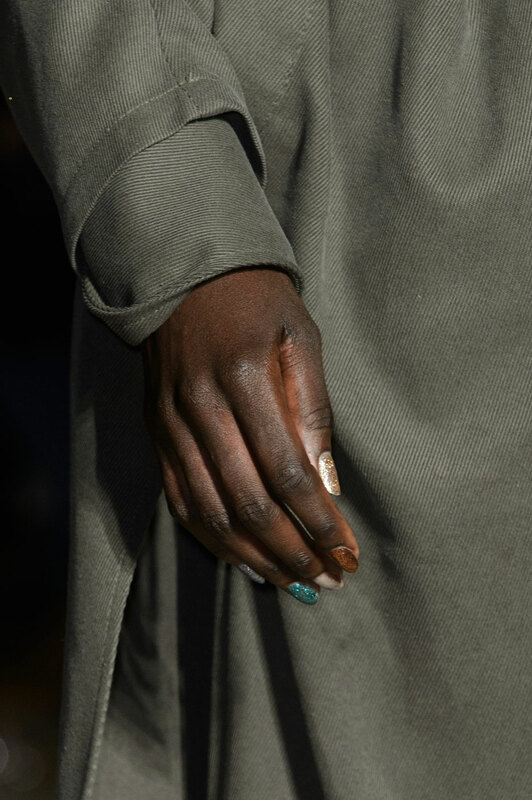 Analysing an olive coloured jumpsuit, and seeing how well a jacket fell, even oversized to the max, it was clear that the first lady hadn’t lost her touch. 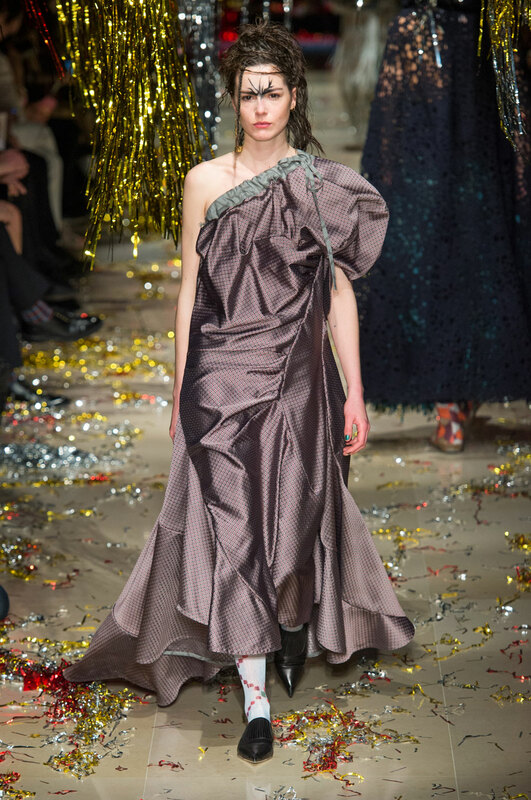 The show ended with a bang in the form of two taffeta ball gowns, worn by him and her. 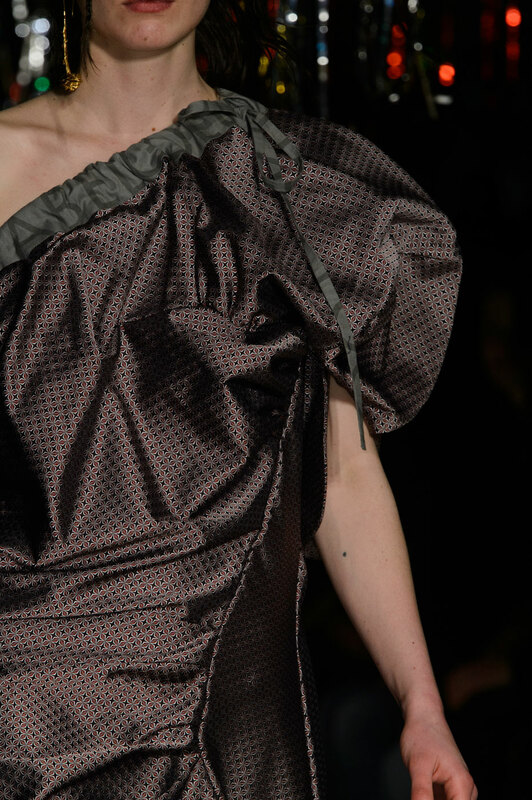 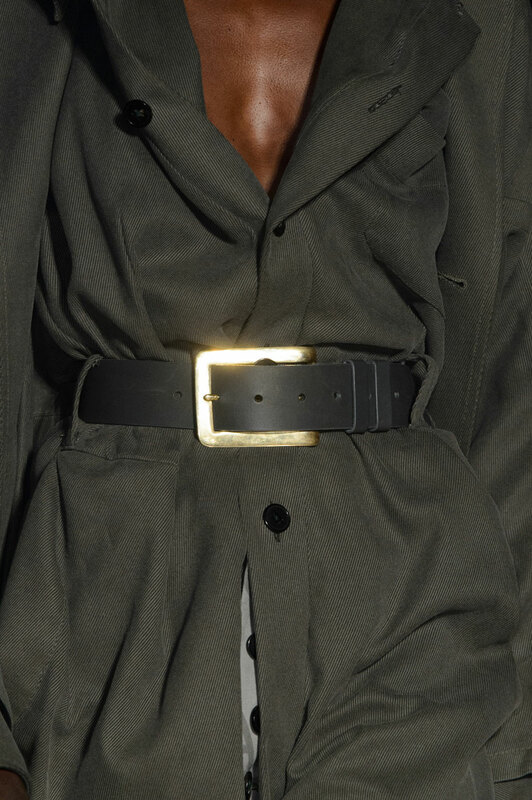 The oversized structural designs were the epitome of Westwood’s work over the years rolled into one look. 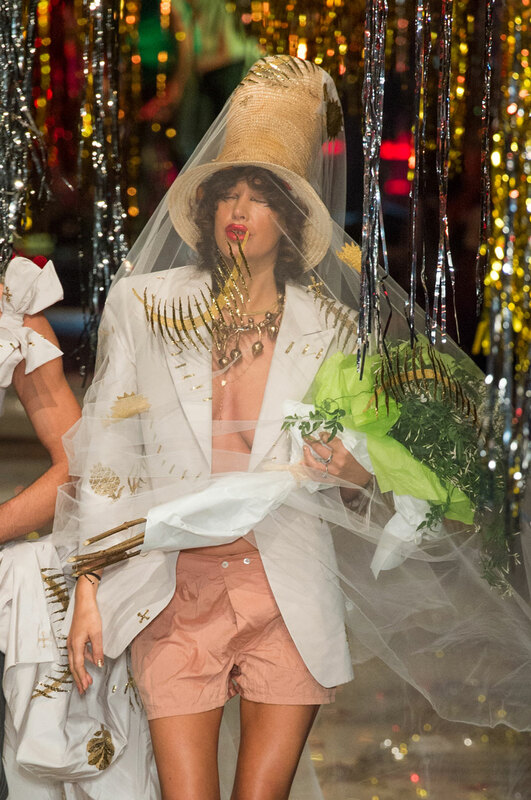 Closing the show was a bride and groom whom walked down the tinsel decorated catwalk in reversed gendered outfits. 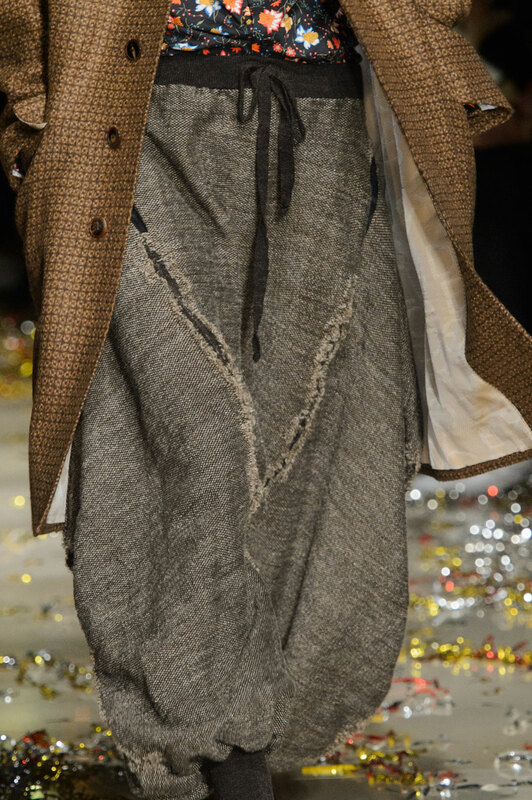 He wore a structural white dress complete with bow tie detailing and paired with tapered trousers. 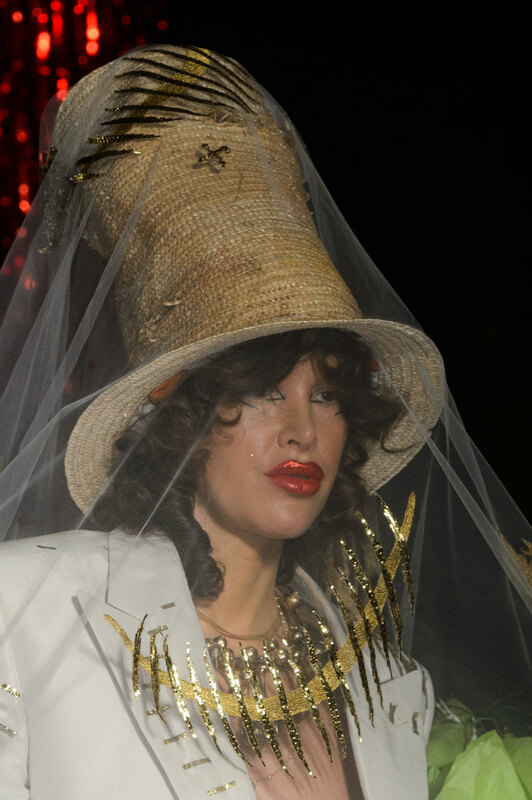 She wore boyfriend style shorts an oversized blazer, with the finishing touches of a top hat and a veil. 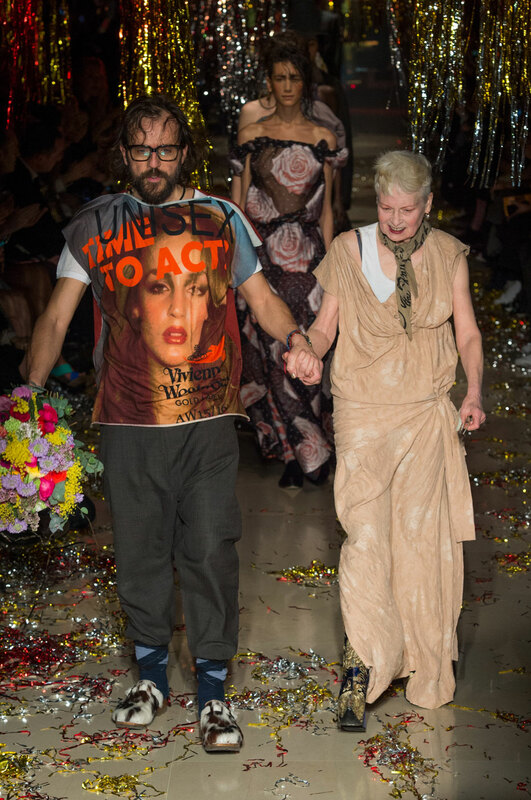 The show was a spectacular, portraying a message close to her heart the only way she knows how.